Teak plantations have been widely established throughout the tropics to produce high quality timber in trees of good growth and stem form. Many factors affect the success of teak planting programmes including site, seed supply and seed quality, management and other biological factors such as insects. Site is the primary factor influencing plantation growth and development. Growth and yield of plantations grown in different site qualities, within and outside the teak region is illustrated. With correct site selection, growth and yield can be improved more than 100 %. The composition of suitable teak sites is reviewed. Seed supply is a factor limiting planting scale and the quality of the plantation, especially so in countries where teak is an exotic. Seed requirement in various plantation options is tabulated and the effect of seed sources (provenances) and improved seed on growth and quality of plantations is demonstrated. A short term programme for improved seed and clonal stock production is proposed. Silvicultural management of teak plantation practices in weeding, thinning and insect and fire protection for growth and quality improvement is reviewed. Teak (Tectona grandis) is one of the most well known timbers of the world. Its timber qualities include attractiveness in colour and grain, durability, lightness with strength, ease of seasoning without splitting and cracking, ease of working and carving, resistance to termite, fungus, and weathering, etc. The species is native to the Indian-Burmese floristic region and found naturally in India, Myanmar, Thailand and Lao (Kaosa-ard, 1983); it is an old introduction to Indonesia (Kaosa-ard, 1981). Due to its high timber qualities, market demand, ease of domestication and cultivation, teak plantations have been widely established throughout the tropics from the 1850s (FAO, 1956, 1957). Teak has been successfully established as an exotic in many countries, e.g. Sri Lanka, Bangladesh and China in Asia; Ghana, Nigeria, Ivory Coast, Senegal, Togo and Benin in West Africa; Sudan and Tanzania in East Africa; Trinidad, Puerto Rico and Panama in Central America; Brazil and Ecuador in South America (FAO, 1957; Keogh, 1994; Hougs, unpublished data). The global teak plantation area recorded in 1990 was about 1.6 million ha (Hougs, unpublished data) which comprises 75 % of the high grade tropical hardwood plantations (Keogh, 1994). The main objective is to produce high quality timber trees with good growth. Although teak has been ranked as a high priority species in many countries, its planting programme is still limited to a small or medium scale in many countries. Keogh (1994) notes the proportion of teak to overall plantation in the tropics fell sharply from 11 % in 1980 to 5 % in 1990. This is so especially where teak is grown as an exotic species. There are many factors limiting the success of teak plantation establishment. The three main factors are site quality, quality and quantity of planting materials, and silvicultural management. The main objective of teak plantation establishment is to produce high quality timber in trees with good or acceptable growth rates. To achieve these objectives, the planting site must be suitable for the growth and development of teak. Teak plantations have been established throughout the tropics, within and outside its natural distribution range. This covers a wide range of climatic conditions, i.e. from the equatorial type to the sub-tropical type with a range of rainfall and temperature of 500-3,500 mm and 2°-48°C (minimum and maximum range) respectively (Kaosa-ard, 1981). Soil conditions also vary from infertile acidic to fertile alluvial. A large variation in growth and other tree characters such as stem form, mode of branching, flowering habit and wood quality of the plantation commonly results. The mean annual volume increment (MAI) of teak plantations over a wide range of plantation conditions varies from 2 m3/ha/year to >15 m3/ha/year at the half rotation age of 30-40 years (FAO, 1956; White, 1991; Keogh, 1994). 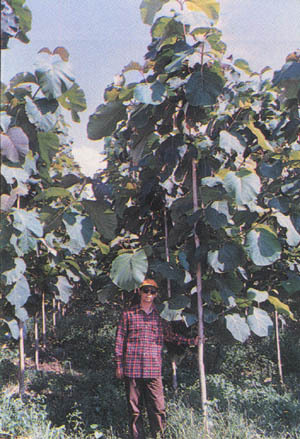 Keogh (1994) recommended that the MAI of teak plantation should be not less than 8m3/ha/year in commercial planting operations. The site for teak planting should be carefully selected, e.g. through species (site matching. Within a planting zone, the effect of site quality on plantation growth may be demonstrated through the construction of Site Index curves. Data presented in Table 1 show the difference in diameter growth of teak plantations grown in different site qualities, both within and outside teak's natural distribution range. Through site selection, it is shown in the case of Indonesia that the growth of the plantation can be improved to over 116 %. It is common knowledge among loggers that teak from wetter site conditions, e.g. along river banks or in the lower moist teak forest, is usually darker in wood colour than that from drier site conditions. Teak wood colour seems to be influenced by the site. As the golden brown wood colour is one of teak's most attractive timber qualities, the variation in wood colour and texture has been widely studied (Sono and Saensakul, 1959; Sandermann and Simatupang, 1966; Sunyata et al., 1992; Kaosa-ard, 1993). A study on clonal variation in wood colour and texture in Thailand in a 20-year old clonal test clearly demonstrated that teak wood colour and texture is strongly controlled by the planting site (Kaosa-ard, unpublished data). In this test, clones of trees from different locations with different wood colours (i.e. dark brown, golden brown, light brown colours, and wood textures, i.e. stony-wood and waxy-wood textures (produced similar wood colour and texture when planted on the same site (< 0.5 ha plot). Similarly, results of 14-year old intentional provenance trials in Thailand (established within and outside the teak bearing area) clearly showed that there is no or little significant effect of provenance or seed source on wood colour (i.e., the golden brown colour) and wood density (Kaosa-ard, 1993). These trials consist of provenances from India, Thailand, Indonesia, Lao and African races. Within a provenance, there is a marked site effect on wood colour, e.g. golden brown colour (Kaosa-ard, 1993). The proportion of trees with golden brown wood colour decreases from a natural teak bearing site (Ngao, Lampang) to a non-teak bearing site (Khon Kaen), i.e., from 74% to 63% (Kaosa-ard, 1993). The cause of such variation is still not known but is possibly due to differences in soil chemistry and moisture content in the two planting sites. It is shown that the planting site has a strong effect on the growth, development and wood quality of teak plantations. The productivity of a plantation can be largely improved through the selection of a correct site for the plantation programme. It is noted that the teak distribution pattern in its natural range is of discontinuous or patchy type (Troup, 1921; FAO, 1956,1958). Size, quality, density, and the form of teak trees varies from one location to another. There are several factors which control the distribution and growth pattern of the species. The major factors include the amount and distribution of rainfall and moisture, soil and light. Teak grows naturally over a wide range of climatic condition, from the very dry (500 mm/year) to the very moist (up to 5,000 mm/year) (Seth and Khan, 1958; Kaosa-ard, 1981). Under very dry conditions, the tree is usually stunted and shrubby. Under very moist conditions, the tree is large and fluted and usually behaves like a semi-evergreen species; the wood quality is poor in terms of colour, texture and density. For the production of high quality wood with optimum growth, moisture conditions (as expressed by annual rainfall) should be between 1,200 and 2,500 mm with a marked dry season of 3-5 months (Kaosa-ard, 1981; Keogh, 1987). The dry season refers to a period in which the cumulative rainfall is less than 50 mm per month (Keogh, 1987). Teak grows best on deep, well-drained alluvial soils derived from limestone, schist, gneiss, shale (and some volcanic rocks, such as basalt. Conversely, the species performs very poorly, in terms of growth and stem form, on dry sandy soil, shallow soil (hard pan soil or lower water table soil), acidic soil (pH < 6.0) derived from laterite or peatbog, and on compacted or waterlogged soil (Kulkani, 1951; Kiatpraneet, 1974; Kaosa-ard, 1981; Bunyavejchewin, 1987; Srisuksai, 1991). Teak soil is relatively fertile with high calcium (Ca), phosphorus (P), potassium (K), nitrogen (N) and organic matter (OM) contents (Bhatia, 1954; Seth and Yadav, 1958; Samapuddhi, 1963; Kiatpraneet, 1974; Sahunalu, 1970; Kaosa-ard, 1981; Bunyavejchewin, 1987; Srisuksai, 1991). Several studies indicate that teak requires relatively large amounts of calcium for its growth and development, and teak has been named as a calcareous species (Seth and Yadav, 1958; Kaosa-ard, 1981; Tewari, 1992). The amount of calcium content in the soil is also used as an indicator of teak site quality. That is, the greater the proportion of teak to other associate species, the higher the calcium content in the forest soil (Bunyavejchewin, 1983, 1987). Soil pH is another factor limiting the distribution and stand development of the species. Although the range of soil pH in teak forests is wide (5.0-8.0) (Kulkarni, 1951; Samapuddhi, 1963; Bunyavejchewin, 1983, 1987), the optimum pH range for better growth and quality is between 6.5-7.5 (Seth and Yadav, 1959; Kaosa-ard, 1981; Tewari 1992). Teak has been classified as a pioneer species. Hence, it requires a high light intensity for its growth and development (Troup, 1921; Kermode, 1957; Kadambi, 1972; Kitinanda, 1969; Kwoboshi, 1974). A study conducted by Kwoboshi (1974) clearly demonstrated the effect of light intensity on the growth and development of teak seedlings; dry matter production of teak seedlings decreases sharply with a decrease in light intensity. In his study, the dry matter production of seedlings grown under low light intensity of 25% (for 8 months) was 0.6 gm as compared with 14.6 gm of seedlings grown under high light intensity of 75% of full daylight. The optimum light intensity for seedling growth and development is between 75-90% (Kwoboshi, 1974). Apart from rainfall and moisture, soil and light intensity, other factors such as temperature and elevation also play important roles in limiting the distribution and growth pattern of the species. It is known that teak grows well under warm and humid conditions. A series of studies in controlled environments indicated that the optimum temperature for growth and development of the species is 27-36°C (Gyi, 1972; Kanchanaburangura, 1976; Kaosa-ard, 1977). This range of temperature is quite normal within teak tropical range. Teak poorly tolerates cold and frost conditions during the winter period. Under frost conditions, seedlings and saplings are severely damaged and die (Kaosa-ard, 1981), one reason why the species cannot grow at elevations over 700 metres. Seed supply is one of the most critical factors limiting the teak planting programmes. This is especially so in countries where teak is grown as an exotic species and seed used is totally from old trials or pilot plantations. Problems of seed supply, including the amount and quality of the annual seed requirement, are considered. It is well known that teak germination is poor and sporadic as a result of its dormancy behaviour. Under nursery conditions the germination of untreated seed is about 30-50% over a germination period of 50 days (Anon., 1956; Gartner, 1956; Suangtho, 1980; Kaosa-ard, 1986; Kumaravelu, 1993; Phengduang, 1993). This germination behaviour causes a very low plant percentage in nursery production. 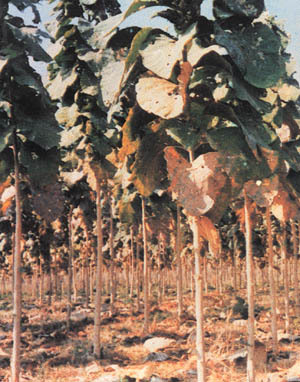 Wellendorf and Kaosa-ard (1988) estimated that the plant percentage in a teak nursery is only 5%, or five plantable seedlings produced from 100 seeds sown in one crop year. This rate is commonly obtained in large-scale nursery operations (4-5 million seedlings per year), where seed pre-sowing treatment is not practical for the large quantity of seed. The low plant percentage in nursery production is due primarily to poor seed germination behaviour and the growth competition of the non transplanted seedlings in the nursery beds (Kaosa-ard, 1986). The amount of seed required for a hectare of plantation with 4 (4 metre spacing is about 8 kg, including 25% for beating up (Wellendorf and Kaosa-ard, 1988). Estimation of seed requirement for various options in a teak planting programme is given in Table 2. This is based on the fact in Thailand that 1 kg consists of 1,800 seeds; 1 litre contains 450 seeds and the plant percentage is 5% (Kaosa-ard 1986; Wellendorf and Kaosa-ard, 1988). Table 2 shows that the requirement varies from 8 to 34 kg/ha per plantation. Similar estimates of seed requirement are reported from India, i.e., 2.5-43 kg/ha (Sirimathi and Emmanuel, 1986). Such large amounts of seed required per hectare of plantation can be reduced through improvement of seed germination (i.e., seed pre-sowing treatment) and nursery techniques (sowing density, sowing, thinning and transplanting techniques, containerised seedling techniques, etc). The success of planting programmes depends not only on the site quality but also on the genetic quality of the planting materials. Although the growth and yield of the plantation can be largely improved through site selection, stem quality (i.e., straightness, persistence of stem axis, branching, flowering, etc.) is strongly controlled by genetic make-up (Keiding et al., 1986; Wellendorf and Kaosa-ard, 1988; Kaosa-ard, 1993). The results of international teak provenance trials have clearly demonstrated the effect of provenance or seed source on growth, stem quality, early flowering habit and health performance (Keiding et al., 1986). Through correct selection of provenance or seed source, growth and stem quality can be improved (from the provenance means) as high as 23% and 17% respectively (Keiding et al., 1986). In many cases, the local provenances performed only as well as, or even poorer, than the exotic provenances. The use of improved seed (i.e., from seed production areas, seed orchards and plus trees) is most essential in the improvement of growth, stem quality and other characters of the plantation. It has been estimated that by using such improved seed, the growth and/or volume production gain of the plantation is increased (from base populations) by 5-25%, depending on types of seed source and planting site (Wellendorf and Kaosa-ard, 1988). The use of improved seed or plant materials is shown to be essential to increase the growth and quality of plantations. To obtain such improvements, Seed production areas and/or seed orchards are required. A Seed Production Area (SPA) is a converted plantation or a natural stand for seed production, treated by removing all inferior trees, and SPAs seem the most practical short term option for improved seed production programmes. An abundance of improved seed can be obtained within one year of establishment. Through the SPA option, the gain in volume production of plantations is 5-15% over routine seed sources (Wellendorf and Kaosa-ard, 1986; Kaosa-ard, 1993). The Clonal Seed Orchard (CSO) is another option of seed source establishment. It is a plantation of mixed clones derived from plus trees, designed, established and managed for seed production purposes. It is established as a propagation part of the improvement programme. Generally, the CSO starts producing seed at 10-15 years and its initial gain is about 25% over the base population (Wellendorf and Kaosa-ard, 1986; Kaosa-ard, 1993). Seed production capacity of both SPAs and CSOs is relatively poor, at least in the case of Thailand. The production capacity in the SPA and CSO is about 10 and 70 kg/ha of teak seed respectively (Kaosa-ard, 1979; Meekaew, 1992). Low production capacity of teak seed in the CSO is also reported from India, 0.5-1 kg per tree or approximately 50-100 kg/ha (Tewari, 1992). However, a contrasting result is reported from Nigeria, where the productivity of the CSO is as high as 734 kg/ha (Egenti, 1981). The needed areas of SPAs and CSOs to support a 1,000 ha annual planting programme has been estimated and given in Table 3. This estimation is based on available information from Thailand where the seed production capacity in SPAs and CSOs is 10 and 70 kg/respectively. Apart from SPA and CSO, tissue culture is another option for mass supplying of genetically improved materials for the planting programme of this species. This technique of propagation has been developed successfully for commercial propagation of selected plus trees (Kaosa-ard et al., 1987; Kaosa-ard and Apavatjarut, 1988, 1989). 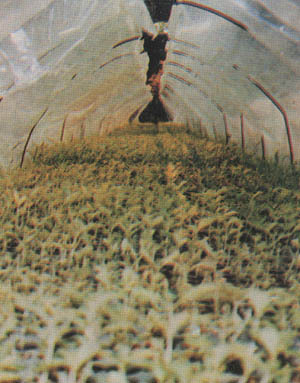 In this technique, shootlets are produced under laboratory condition and are then transferred to glasshouse conditions for rooting. The rooted shootlets or plantlets are transplanted for stock production. Through this process, the cost of shootlet production (as estimated in 1989) was US$5.12 per 100 shoots at 1 million scale of production (Kaosa-ard, 1990). This production cost seems to be the same level as the cost of seed production (viable seed) in the CSO (Kaosa-ard, 1990). This CSO production cost includes establishment and maintenance of CSO for at least 10 years prior to full seed production, plus the cost of seed collection and processing. Apart from site and seed problems, the success of teak plantation establishment also depends largely on silvicultural management. The common management includes spacing, weeding, fire protection, insect and disease protection and thinning. Initial spacing of teak plantation varies (1.8×1.8 to 4×4 m) depending on many factors as site quality, cost of establishment, thinning regime, small wood utilization, planting system, e.g. agro-forestry, intercropping etc. However, site quality seems to be the priority factor directing the size of spacing in the teak planting programme. Results of 12-year-old spacing trials (2×2, 3×3, 4×4, 6×6 m) in Thailand clearly demonstrated the effects of initial spacing on growth, stem quality and weed control in teak plantations of different site conditions. Under dry site conditions, where the initial growth rate of the plantation is poor (e.g. < 1.0 metre per year in height), close spacing of 2×2 m is most suitable. Conversely, the initial spacing can be wider up to 4×4 m, i.e. for cost reduction, under good site conditions (Kaosa-ard, 1980). Based on this study, a 3×3 m spacing (1,111 trees/ha) has been recommended and used as the routine spacing in Thailand. However, in areas where wider spacing is required for the application of agro-forestry systems or machine weeding, the 4×2 m spacing (1,250 trees/ha) is used. Similar results of spacing trials are reported from India where close spacing of 1.8×1.8m and wider spacing of 3.6×3.6 m are suitable for dry and good (rainfall <1,500 mm) site conditions respectively (Tewari, 1992). 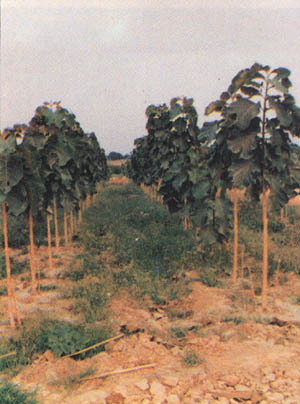 Various spacings are used in teak plantation establishment under different site conditions such as 2.5×2.5 m, 2.7×2.7, 3.6×1.8 m and 3.6×2.7 m in India (Tewari, 1992), 2×2 m in Bangladesh (Banik, 1993), 2×3 and 3×3 m in China (Anon., 1993), 2.5×2.0 m in the Caribbean and Central America (Keogh, 1987), 2.6×2.6 m in Myanmar (Gyi, 1993), 3×3 m in Sri Lanka (Maddugoda, 1993) and 3×2 m to 5×2 m in Indonesia (Anon., 1993). 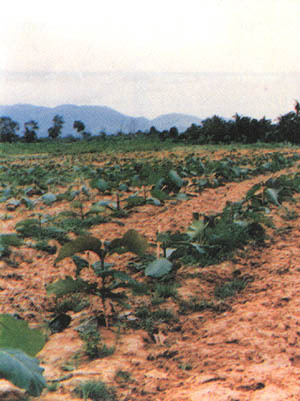 Planting time has marked effect on survival and growth in teak plantations, especially when stump planting is practised (Kaosa-ard, 1977). A series of studies on stump storage and planting time in Thailand demonstrated that survival and growth in the early established plantations decreased sharply from May planting through June planting to July planting (Kaosa-ard, 1977). The most suitable planting time for teak is soon after the arrival of the monsoon showers or in the beginning of the rainy season. Phenological development studies showed the importance of planting time, especially on growth (Kaosa-ard, 1982). Teak has only one growth flush period throughout the year (Kaosa-ard, 1982). Shoot growth, as expressed in percentage of annual growth, starts soon after the first rain shower (late April), reaches its peak in the beginning of the rainy season (May-June), thereafter declines sharply in the middle of rainy season (July-October) and ceases during the dry season (November-April) (Kaosa-ard, 1982). Kaosa-ard (1982) also recommended that teak be planted just prior to, or during the growth flush period, i.e. between late April and early June, depending largely on the arrival of the first monsoon rain. Teak is a light demanding species and its growth and development is reduced sharply under poor light conditions. Hence, intensive weeding is very necessary during early establishment of the plantation, i.e. 1-3 years. The first thinning is conducted at 5-10 years after planting, depending on site quality and the size of initial spacing. Generally, under good site and close spacing (1.8×1.8 m and 2×2 m) the first and second thinning (mechanical thinnings) are conducted at 5 and 10 years respectively. About 25% of the trees are left for further growth and development after the second thinning. In the Caribbean and Central American region, the first and second thinnings (mechanical thinnings) are conducted when the plantation height is 8 and 16 m respectively (Koegh, 1987). Times and methods of subsequent thinning however vary depending on site and economic considerations. Construction of Site Index tables in relation to stand density at different stand ages is a guideline for setting a thinning regime for each planting site. Insect damage is a serious problem in teak plantations. This is especially so where the intensive forest farming system is practised, e.g. in well-irrigated plantations. The most common insects which cause severe damage plantations are defoliators and stem borers. Defoliator insects cause severe defoliation and, hence, reduce growth rate, apical dominance and the seed production capacity of plantations, seed production areas and seed orchards. The most important defoliators causing severe damage in teak plantations throughout the tropics are Hyblaea puera Cramer (Hyblaeidae) and Eutectona machaeralis Walker (Pyralidae) (Chaiglom, 1963; Tewari, 1992). Outbreaks of these insects may occur 2 or 3 times during the growing season (Chaiglom, 1963). 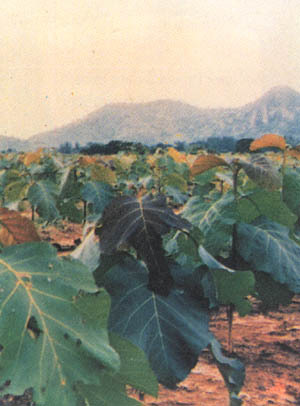 After outbreaks, especially of Hyblaea puera, the plantation growth rate may be reduced by as much as 75% (Chaiglom, 1963). Control of outbreaks of these insects requires application of both chemical and biological agents, e.g. Bacillus thuringiensis or BT agents. Stem borers cause severe damage; in young plantations (1-5 years old) damaged trees may die back or top break causing a reduction in growth rate and stem quality. The most important stem borer in young teak plantations is the red or coffee borer Zeuzera coffeae Nietner (Cossidae). In Thailand this insect causes severe damage in private plantations where the planting sites were previously sugar cane and tapioca fields. In old plantations, i.e., over 10 years, the beehole borer Xyleutes ceramicus is the most important stem borer. It causes severe damage to the standing trees and also reduces the value of timber, with a close relationship between site quality and the degree of damage caused by the beehole borer (Choldumrongkul, 1989). Plantations established on good site quality have higher degrees of damage than those on poor site quality (Choldumrongkul, 1989). At present, there is no practical chemical and biological method for controlling outbreaks of the beehole borer. Silvicultural treatments such as weeding, control burning, thinning, and intercropping may be the only methods which can reduce the insect populations. Teak plantations have been widely established throughout the tropics with the main objectives to produce high quality timber within a period of 40-80 years. In general, the productivity of the teak plantation is 8-10 m3/ha/year. Three main factors affect growth and quality of the plantation: site quality, seed supply and silvicultural management. Site quality has direct effect on the growth and development of the plantation. The rotation age can be greatly reduced through site selection. Teak grows well on moist sites. To produce high quality timber trees, the site should be subjected to a dry period of 3-5 months duration. Teak soil is deep, well- drained, and alluvial with high calcium, organic matter and other element content. The soil pH is 6.5-7.5. Teak is a light-demanding species. As a result, intensive weeding in 1-5 year-old plantations is very important. The supply of improved seed for planting programmes is a major problem especially in countries where teak is an exotic. A large quantity of improved seed can be obtained through establishment and management of Seed Production Areas and Seed Orchards. Clonal propagation by tissue culture is an option for mass production of planting stock. This technique is technically and economically feasible. Appropriate and timely silvicultural management must be carried out to improve both the growth rate and quality. Initial spacing has marked effects on growth, quality and establishment cost. In poor site quality areas plantations should be established with close spacing. Planting time also plays an important role on initial growth and survival of the plantation. The most suitable time for teak planting is during the growth flush period, i.e., the beginning of rainy season. Intensive weeding should be carried out during the first five years after establishment. The outbreak of defoliators and stem borers has become a serious problem; there is no practical method for controlling these insects. First and second thinnings are conducted at ages 5 and 10 years in close spaced plantations using a simple mechanical thinning technique. Subsequent thinnings are carried out using relevant Site Index and Stand Density Tables as thinning guidelines. Anon, 1956. India In "Country Reports on Teak Forestry" FAO, Rome 21-48 pp. Anon, 1993. Teak in Indonesia. In "Teak In Asia" Technical Document GCP/RAS/I34/ASB, FORSPA Publication 4, FAO-RAPA 35-40 pp. Banik, R.L. 1993. Teak in Bangladesh. In "Teak In Asia" Technical Document GCP/RAS/I34/ASB, FORSPA Publication 4, FAO-RAPA 1-10 pp. Barnes, R.D. 1984. A multiple population breeding strategy for Zimbabwe. In. "Provenance and Genetic Improvement Strategies in Tropical Forest Trees". Edited by R.D. Barnes and G.L. Gibson, 619 - 632 pp. Brockelman, W.Y. and Baimai,V. 1993. Conservation of biodiversity and protected area anagement in Thailand. Proc. of Skill Transfer Workshop conducted by MIDAS Agronomic Co. Ltd., for World Bank/GEF/Pre-investment Study on Conservation Area Protection, Management and Development Project, Bangkok. Bryndum, K. and Hedegart, T. 1969. Pollination of teak (Tectona grandis Linn. f.). Silv. Genet.18:77-80 pp. Cameron, A.L. 1966. Genetic improvement of teak in New Guinea. Aust. For. 30:76-87 pp. Choldumrongkul, S. and C. Hutacharern 1986. The relationship between the flower development of teak and its associated insects. Jour. Nat. Res. Coun. of Thailand 18: 54-52 pp. Egenti, L.C. 1981. Aspect of pollination ecology of teak (Tectona grandis Linn. f.) in Nigeria: Pollinators and fruit production. In "Proceedings of the Symposium on Flowering Physiology" XVII IUFRO World Congress, Kyoto, Japan. 27-30 pp. Egenti, L.C. 1981a. Aspect of pollination ecology of teak (Tectona grandis Linn. f.) in Nigeria. Flowering and insect dynamics. In "Proceedings of the Symposium on Flowering Physiology" XVII IUFRO World Congress, Kyoto, Japan. 17-20 pp. Egenti, L.C. 1981b. Aspect of pollination ecology of teak (Tectona grandis Linn. f.) in Nigeria. Viability of reproductive units. In "Proceedings of the Symposium on Flowering Physiology" XVII IUFRO World Congress, Kyoto, Japan. 21-26 pp. FAO, 1957. Report on teak growing under exotic conditions. FAO/TSC-57/3, FAO Rome. Gartner, I.C. 1956. Indonesia In Country Reports on Teak forestry FAO, Rome 49-105 pp. Gram, K. and S.C. Larsen, 1958. The flowering of teak (Tectona grandis Linn. f.) in aspect of tree breeding. Nat. His. Bull. Siam. Soc. 19: 1-6 pp. Gyi, K. K. 1972. An Investigation of Factors relevant to Development of Teak Plantation in South East Asia with Particular Reference to Burma. M.Sc. Thesis, Australian National University, Canberra Australia. Gyi, K.K 1993. Teak in Myanmar. In "Teak In Asia" Technical Document GCP/RAS/I34/ASB, FORSPA Publication 4, FAO-RAPA 51-62 pp. Harahap, R.N. and I. Soerinegara, 1977. Heritability of some characters in teak. In Proc. "The Third World Consultation on Forest Tree Breeding" Vol 2: IUFRO/CSIRO, Canberra. Hardiyanto, E.B., Sunyoto, O.H. Soeseno and M. Naiem 1992. Early performance of teak (Tectona grandis Linn.f.). In "One Century of Sustainable Forest Management with Special Reference to Teak in Java" Proc. International Symposium on Sustainable Forest Management, Yogyakarta, Indonesia. 177-180 pp. Hedegart, T. 1974. The Teak Improvement Centre: Ten years after initiation. Vanasarn 32: 342-356 p.
Kanchanaburangura, C. 1976. Teak (Tectona grandis Linn. f.) Seedlings and Provenance Variation. M.Sc. Thesis, Australian National University, Australia. 216 p.
Kaosa-ard, A. 1977. Physiological Studies on Sprouting of Teak (Tectona grandis Linn. f.) Planting Stumps. Ph.D. Thesis Australian National University, Canberra Australia 370 p.
Kaosa-ard, A. 1979. Summary results of research on teak seed production. In Teak Seed Centre, Annual Report No. 2. Kaosa-ard, A. 1981. Teak Its natural distribution and related factors. Nat. His. Bull. Siam. Soc. 29: 55-74. Kaosa-ard, A. 1986. Teak in ASEAN: A Survey Report. ASEAN CANADA Forest Tree Seed Centre, p.60. Kaosa-ard, A. 1986. Teak (Tectona grandis Linn. f.) nursery techniques with special reference to Thailand. DANIDA Forest Seed Centre Seed Leaflet No. 4A 42 p.
Kaosa-ard, A. 1993. Teak international provenance trials I. Growth and stem quality. In Proceedings "50th Year of Huay Tak Teak Plantation: Teak Seminar" 113-129 pp. Kaosa-ard, A. 1993a. Teak international provenance trials I. Wood production and quality. In Proceedings "50th Year of Huay Tak Teak Plantation: Teak Seminar". 294-312 pp. Kaosa-ard A., Apavatjrut, P. and Paratasilpin,T. 1987. Teak tissue culture. In Proceedings of His Majesty's Fifth Cycle Commemorative Conference of USAID Science Research 201-206 pp. Kaosa-ard, A. and P. Apavatjrut 1988. Teak tissue culture: Rooting and transplanting techniques. In Biotechnology Conference, Washington D.C.
Kaosa-ard, A. and Apavatjrut, P. 1989. Teak (Tectona grandis Linn. f.) tissue culture. In Regional Symposium on Recent Research Development in Tree Plantation for Humid and Subhumid Tropics of Asia, in Malaysia, June 5-9, 1989. Kaosa-ard, M. 1990. Teak Tissue Culture: Cost Analysis Report RFD/CMU/PSTC 1990 26 p.
Katasubrato, Y. 1992. The history of sustainable management in Indonesia, the case of teak. In "One Century Sustainable Forest Management with Special Reference to Teak in Java" 3-39 pp. Keiding, H. 1966. Aim and prospects of teak breeding in Thailand. Nat. His. Bull. Siam. Soc. 21 (1&2). Kedharnath, S. and J.D. Matthews, 1962. Improvement of teak by selection and breeding. Ind. For. 88: 277-284. Kumaravelu,G. 1993. Teak in India. In "Teak In Asia" Technical Document GCP/RAS/I34/ASB, FORSPA Publication 4, FAO-RAPA 27-36 pp. Loetsch, F. 1958. Report to the Government of Thailand on Forest Inventory of the Northern Teak Bearing Provinces. FAO Report No. 895, Rome. Meekaew, P. 1992. Genetic Variation in Growth, Seed Production and Foliar Nutrients of Teak. M.Sc. Thesis, Faculty of Forestry, KU, Bangkok, Thailand 73 p.
Namkoong, G., R.D. Barns and J. Burley 1980. A philosophy of breeding strategy for tropical forest trees. Tropical Tree Papers No.16, Univ. Oxford. 67 p.
Namkoong, G.; H.C. Kang and J.S. Brouard 1988. Tree Breeding Principles and Strategies. In: Monographs on Theoretical and Applied Genetics 11, Springier-Verlag 180 p.
Nikles, K.G. 1992. Conservation and use of genetic diversity in improvement programmes with industrial forest tree species. In. "Proc. of the Regional Symposium on Recent Advances in Mass Clonal Propagation of Forest Tree for Plantation Programmes" RAS/91/004 Field Document No. 4 83-109 pp. Person, A. 1971. Observations from a progeny trials of at Longuza. Tanzania Silv. Res. Note, No. 24. Phengduang, V. 1993. Teak in Laos PDR. In "Teak In Asia" Technical Document GCP/RAS/I34/ASB, FORSPA Publication 4, FAO-RAPA 41-50 pp. RFD, 1989. Forestry Statistics of Thailand, RFD. Siripatanadilok, S. 1974. Development of teak flower (Tectona grandis Linn. f.). For. Res. Bull. No. 31, Fac. Forestry, KU, Thailand 68 p.
Srimathi, R.A. and Emmanuel, C.J.S.K. 1986. Jour. Trop. For. 2: 256-268. Suangtho, V. 1980. Factors Controlling teak (Tectona grandis Linn. f.) Seed Germination and Their Importance to Thailand. M.Sc. Thesis Australian National University, Canberra, Australia. Suksileung, P. 1975. Clonal variation and inheritance in growth characteristics of teak (Tectona grandis Linn.f.). M.Sc. Thesis, Fac. For. Kasetsart University, Thailand 45 p.Tewari, D.N. 1992. "A Monograph on Teak (Tectona grandis Linn. f.)" Int. Nat. Book Dist. Dehra Dun, 479 p.
White, K.J. 1991. Teak. Some aspects of research and development. FAO/RAPA 1991/17. Teak is one of the most valuable timbers in the world. The species is native to South and Southeast Asia but plantations have been established throughout the world's tropics. The major problem in plantation establishment of this species is the supply of genetically improved materials for large scale planting programmes; to overcome shortages both short- and long-term improvement and propagation strategies are proposed. The short-term strategy includes the establishment and management of seed production areas, clonal seed orchards and clone banks for seed and clonal stock production. The mass clonal propagation of selected trees, tissue culture in combination with a plantlet cutting technique, is recommended. Long-term improvement strategies involve the development and management of gene resource populations, breeding populations and propagation populations. Genetic structures and functions of these three populations are discussed. In long-term breeding populations, the formulation, establishment and management of single and multiple breeding populations suitable for teak breeding programmes are discussed in detail. Key words: Tectona grandis, Thailand, seed, seed orchards, breeding, tissue culture, genetics, research. Teak (Tectona grandis Linn. f.) is one of the most valuable timber tree species in the world. Its timber quality is recognised as attractiveness in color and texture, suitability for all aspects of household construction, ease of working and carving, resistance to termites, fungi and weathering etc. The species is a member of the Indo-Burmese floristic type and occurs naturally in India, Myanmar, Thailand, and Lao (Kaosa-ard, 1983). In Indonesia, the species is a long established introduction to Java (about 700 years) and neighboring islands, such as Muna, Bawean, Lombok, etc., and thereafter wildly distributed throughout the area (Kaosa-ard, 1983, 1986). The species in Indonesia has become a natural source which is isolated from the continental mainland. Due to its high timber quality and value, plantations of this species have been widely established from the early 1800s both within and outside its natural region (FAO, 1957). At present (1990), more than 1.6 million ha of teak plantation have been established throughout the tropics (Hougs, unpublished data). However, about 90% of this plantation is in the Asian region, especially in India, Myanmar, Thailand and Indonesia where abundant seed can be obtained for large-scale planting. Outside its natural habitat, although its performance is very impressive in many countries, teak planting programmes are still limited, due mostly to an insufficiency of seed. At present teak seed supply and/or exchange, especially from natural sources, is limited to research purposes. There is no commercial seed dealer within or outside the region, and most of the teak planting agencies or organizations have to rely on their own breeding and seed production programmes. If this problem can be overcome, plantations of this species (especially outside its natural region (will be increasingly promoted. Strategies for short-term propagation and long-term breeding programmes of teak are proposed in order to increase the supply of improved genetic material sufficient for large-scale planting programmes. As many other forest tree improvement programmes, the main elements in the teak improvement programme are: strategies, tree populations, operation and management, research and development. Tree improvement strategies involve planning and execution for achieving general objectives, especially of long term breeding, propagation and conservation in the improvement programme. The formulation and development of an improvement strategy requires biological and technological knowledge including: genetic variation and gain, flowering biology, mating system, seed production, clonal propagation, planting techniques etc. Tree populations in an improvement programme consist of genetic resources, breeding, propagation and wood production. The genetic structures of these four populations are the core elements in the breeding programme. Due to the differences in their objectives, genetic structures, variabilities and long- term utilization, these four populations are usually established and maintained separately. Relationships among these four populations are illustrated in Figure 1. Figure 1. Over time, genetic material is progressed through the series of populations by a process of selection and mating. Operations and management in an improvement programme are mostly concerned with the availability of human resources, financial resources, infrastructure and organization, knowledge of the genetic parameters and reproductive biology of the species, information, technologies, etc. Research and development in an improvement programme is essential to solve certain key problems. Moreover, the development of appropriate technologies will assist and facilitate the breeding activities (e.g. pollen extraction and storage, flowering induction, etc.) and propagation operations (e.g. seed production, cuttings, tissue culture, etc.). ¨ Increased volume production per unit area of the plantation through the improvement of growth rate (e.g. diameter and height growth). ¨ Improved stem quality of trees in terms of: stem straightness; stem - clear bole - or pruning capability; persistence of stem axis; other desirable characters. ¨ Improved wood qualities, e.g. wood color and density. ¨ Production of genetically improved seed (e.g. through the establishment of seed production areas and seed orchards) and vegetative propagules (e.g. through the establishment of clone banks) sufficient for planting programmes. ¨ Establishment of long-term breeding populations for greater cumulative genetic gains of improved characters. ¨ Manipulation and maintenance of genetic variabilities of the breeding populations through as many generations as possible. ¨ Securing the supply of improved seed and/or planting materials of greater cumulative gain for planting programmes. To formulate and develop appropriate strategies for teak improvement, the following knowledge and assumptions are concerned particularly with the amount of seed required, and the method of its production. It is well known that the germination of teak seed is one of the most critical problems in a planting programme, especially where expensive seed from seed orchards is used. Experience gained from the teak growing region, e.g. India, Bangladesh, Myanmar, Thailand, Lao and Indonesia, indicates that the germination of teak in the nursery is very low (30-50%) and sporadic (with a germination period of 10-50 days after sowing (Anon. 1956; Gartner, 1956; Suangtho, 1980; Kaosa-ard, 1986; Kumaravelu, 1993; Phengduang, 1993). This low and sporadic germination is due to the strong dormancy behavior of teak seed, which causes a low plant percentage in nursery production. In Thailand, for example, under a large-scale nursery operation (4-5 million seedlings per year), the plant percentage is markedly low, only 5 % (Kaosa-ard, 1986; Wellendorf and Kaosa-ard, 1988) with only 5 plantable seedlings produced from 100 seeds sown in one growing season. Based on this assumption, the amount of seed required for one hectare of plantation (with spacing of 4 (4 m) is about 8 kg including 25 % for beating up (Wellendorf and Kaosa-ard, 1988). In India, the seed requirements per hectare of plantation vary from 2.5 kg in Tamil Nadu, to 30 kg in Andhra Pradesh and to 43 kg in Gujarat (Srimathi and Emmanuel, 1986). This low germination percentage and the sporadic germination of the seed can be improved to a certain degree (at least in small-scale nursery practices) through various seed pre-sowing techniques including soaking the seed in water or in a mixture of cow dung and water, alternate soaking and sun drying, heat treatment, etc. (Gyi, 1972; Suangtho, 1980; Kaosa-ard, 1986; Tewari, 1992). The seed biodata, annual stump plant requirements and annual seed requirements of 1,000 ha of plantation in Thailand in various planting options are shown in Tables 2 and 3. The most practical option in an improvement programme for the immediate supply of improved seed is in Seed Production Areas (SPA), formed by the conversion of existing older plantations and/or natural stands. Experience in Thailand has shown a great many benefits of SPAs. First, a SPA can produce an abundance of good seed within a year of establishment whereas a Clonal Seed Orchard (CSO) starts producing seed only after 10-15 years. Second, the genetic gain (in terms of growth or volume production) from the SPA is very high, up to 15 %, as compared with unidentified or unimproved seed sources (Wellendorf and Kaosa-ard, 1986; Kaosa-ard, 1993). Through the initial/untested CSO option, the gain is estimated to be as high as 25% (Wellendorf and Kaosa-ard, 1986; Kaosa-ard, 1993). The gain difference between a SPA and a CSO is due primarily to the difference in selection intensity of seed or plus trees, i.e. 1:6-1:8 for the SPA and 1:100-1:1,000 for the CSO. Finally, the cost of SPA establishment and management is much cheaper than a CSO. Although SPAs have many advantages, production capacity is still very low. A series of studies in Thailand show the maximum production capacity of teak seed at the Mae Huad SPA is about 10 kg per ha (Kaosa-ard, 1979). This low seed production, as compared with the CSO, is probably due to a number of factors: a) the higher tree density (160-320 trees/ha); b) the smaller crown canopy; c) older trees and d) a lower proportion of insect pollinators per number of individual flowers. Although the SPA has many advantages, CSOs and/or progeny seed orchards (PSO) are still essential, the core component in a teak improvement programme. In breeding populations, the CSO/PSOs create successive new breeding and propagation populations with greater cumulative genetic gains. In propagation populations, successive CSO/PSOs produce larger quantities of seed with greater genetic gains compared with the SPA. Teak CSOs have long been established throughout the region, e.g. Thailand in 1961 (Boonkird, 1964); India in 1962 (Kedharnath and Matthews, 1962); Papua New Guinea in 1963 (Cameron, 1966); Bangladesh in 1979 (Banik, 1993); Myanmar in 1981 (Gyi, 1993), and Indonesia in 1983 (Anon, 1993). Little is known about seed production capacity in the seed orchards. In Thailand, the seed production capacity in the CSO was in planning estimated at 250 kg per ha (Hedegart, 1976). When full production was reached (i.e. over 20 years old), the seed production capacity proved considerably lower, about 0.7 (0.2-1.5) kg per ramet (tree), for example 70 (20-150) kg per ha during the 5-year observation period (1985-89) at the Mae Gar CSO (Meekaew, 1992). Low production capacity of seed in CSOs is also reported from India (Madhya Pradesh), i.e. 0.5-1 kg per ramet (Tewari, 1992). In Nigeria, in contrast, the production capacity of the CSO is very high, i.e. 0.63-6.56 kg per ramet or 244-734 (404) kg per ha (Egenti, 1981). This higher production capacity is possibly due to: a) the longer flowering period of the CSO which is about 7 months per year (March-September); and b) the greater number of insect pollinators visiting the orchard during the flowering period (Egenti, 1981). Orchards in Nigeria are mostly located in high forest and savanna areas. Based on available data from Thailand, the guideline for estimation of SPA and/or CSO areas for maximum production (10 and 70 kg per ha of SPA and CSO, respectively) of seed sufficient for the 1,000 ha planting programme are shown in Table 3. Knowledge of specific reproductive biology is very important in the formulation of improvement strategies. This knowledge includes maturity and flowering, type of flower, flower initiation, development and structure, pollination mechanism, fruit setting, development and ripening, etc. Teak starts flowering at 6-8 years after planting. However, the first flowering may be as early as 3-4 years and as late as 20-25 years. The first flower panicle usually initiates and develop from the terminal shoot of a stem axis (Gram and Larsen, 1958; Boonkird, 1964). This first flowering habit causes a development of the forked stem of this species (Boonkird, 1964). That is, early flowering trees usually have shorter stem boles than late flowering trees. Teak flowering starts soon after the growth flushing stage, i.e. in the middle of rainy season. The flowering time of this species, however, varies depending on the arrival of the of the rainy season. In the continental South and Southeast Asian region, flowering time usually starts in June-July and lasts from October-December. The flowering season of teak within the teak-growing region is shown in Table 4. The flowers occur in a large panicle and each panicle contains 1,200 - 3,700 flowers (Bryndum and Hedegart, 1969) and may be up to 8,000 flowers as in a case of Papua New Guinea (White, 1991). The flower is white and small (6-8 mm in diameter) and perfect type, consisting of six sepals, six white petals, six stamens and a pistil (Bryndum and Hedegart, 1969). The flower opens for only one day; if no pollination occurs it will drop in that evening or in the next morning (Bryndum and Hedegart, 1969). Although the flower buds start opening in the early morning, the pollination period begins in late morning and reaches a peak during midday, 11.30-13.00, and then declines thereafter (Bryndum and Hedegart, 1969; Hedegart, 1973). This is due to the light requirement for pollen ripening and receptivity. During this pollination period, the pollen is fully developed and is easily transferred by the pollinators. At the same time, a large quantity of fluid exudes on the stigma for trapping pollen (Hedegart, 1973; Siripatanadilok, 1974). The flower usually opens for one day, pollen receptivity also lasts within that day; where as the pollen viability may be up to 3 days after flowering (Egenti, 1981b). Using the vacuum desiccator storage technique pollen viability can be maintained for as long as 24 months and used successfully in the controlled pollination (Egenti, 1981b). Teak is a mainly insect-pollinated species but some wind pollination also occurs (Bryndum and Hedegart, 1969; Hedegart, 1973). A series of studies in Thailand and Nigeria showed that the percentage of fruit setting per flower panicle increases significantly with an increase in number of visits of pollinators (Hedegart, 1973; Egenti, 1981a). Bees, flies, butterflies and ants appear to be major pollinators. A list of these pollinators as identified in Thailand and in Nigeria are shown in Table 5. A series of studies on pollination of teak in Thailand indicated that teak is a cross-pollinating species (Bryndum and Hedegart, 1969; Hedegart, 1973). Under controlled pollination, the highest percentage of self-compatibility is only 5.5 % as compared with crossing which is as high as 60 % (Bryndum and Hedegart, 1969; Hedegart, 1973). Moreover, the selfed seeds are smaller in size and lower in viability and germination percentages than the crossed seeds (Bryndum and Hedegart, 1969; Hedegart, 1973). However, when germination percentage of routine or open pollinated seed is taken into account, the proportion of self-pollinated seed to cross pollinated seed in each seed lot may be as high as 30% (Bryndum and Hedegart, 1969). This is due to the lack of insects for cross pollination activity. In Papua New Guinea, Cameron (1966) reported similarly that the proportion of selfed seed from open pollinated seed orchards is expected to be very high, based on assumptions that cross pollinated seeds will occur only through insect activity and observations that an early flowering isolated seed orchard tree can produce a quantity of viable seed. Early results in isozyme studies in Thailand also indicated that there is a high possibility of selfing in teak seed orchards (Pers. comm. Suchitra Changtrakul). However further studies on the mating system in teak seed orchards using the isozyme marker technique are being conducted. Although a massive number of small flowers occur throughout the flowering period of 4-5 months, only a small quantity of seed can be collected from each tree. This is especially with trees in plantations, SPA and CSO/PSO where the stem density is relatively high. A series of studies in Thailand and Nigeria showed similar results with only 1-2 % (with a range of 0-5 %) of flowers in each panicle successfully developing into fruits (Bryndum and Hedegart, 1969; Hedegart, 1973; Egenti, 1981a). This low fruit percentage is due primarily to: a) the low proportion of pollinators to flowers; and b) the short flowering and pollination periods of individual flowers. Based on this assumption, the production capacity and germination of teak seed can be improved through the increase of populations of insect pollinators in the seed sources (SPA, CSO and PSO). Controlled pollination is one of the most important activities in forest tree breeding programmes. The main objectives are: a) to maintain breeding populations as many generations as possible through maintenance of pedigrees; and b) to increase gain through selection and utilization of both additive and non-additive genetic effects from specific crosses. This activity is, however, considered to be a most expensive and laborious activity. It also requires certain knowledge, equipment and techniques such as flowering induction, pollen collection, handling and storage, flower isolation, emasculation and/or sterilization, pollination, etc. This is required to facilitate and/or to increase fruit setting percentage in the controlled pollination work. With teak, attempts have been made on controlled pollination, e.g. in India (Kedharnath and Matthews, 1962), Thailand (Keiding, 1966; Bryndum and Hedegart, 1969; Hedegart, 1973), and Nigeria (Egenti, 1981a, 1981b). However, full-sib progeny trials of this study have yet to be established and/or reported. There are several factors which limit the development of controlled pollination technique of this species. Firstly, teak flower is only a day life and its pollination period is also very short (2-3 hours a day). Secondly, the emasculation and pollen brushing techniques as used in Thailand may damage the flower stigma. Low and unreliable fruit setting commonly result. Thirdly, proper techniques for mass pollen collection and storage are urgently required. Finally, proper isolation and/or emasculation techniques of either individual flowers or a whole flower panicle are also required to prevent contamination from both, within and outside flowers. Teak occurs naturally in India, Myanmar, Thailand and Lao (along the northern Thai-Lao border) (Kaosa-ard, 1977, 1981). In Indonesia (in central and eastern Java and its neighboring islands), the species was long time (>700 years) introduced and through many generations of succession and distribution, it has been accepted as one of the natural sources (Kaosa-ard, 1981, 1986). Due to its wide range of distribution, three main natural populations, i.e. the Indian, the Burmese-Thai-Lao and the insular (Indonesian) populations, have been grouped according to their geographical differences (Hedegart, 1976). Within each population, a number of sub-populations are also divided such as the "dry interior", the "moist west coast" and the "semi-moist east coast" sub-populations of the Indian population (Keiding et al., 1986). Apart from natural populations, the species has been introduced since the 1800s and is well acclimatized in many countries in the tropics (FAO, 1957). Two main "land race" populations, i.e. the "African land races" and the "Central American land races", have been grouped in the testing programmes (Keiding et al., 1986). Provenance variations in wood quality, growth rate, stem form, seed morphology and germination and other characters are substantially reported (Nair and Mukerji, 1960; Hedegart, 1974; Keiding, 1973; Kanchanaburangura, 1976; Keiding et al., 1986; Kaosa-ard, 1993, 1993a). A series of international provenance trials (75 provenances and 48 field trials) established in the early 1970s clearly demonstrated effects of provenances or seed source on growth, stem quality and health of this species (Keiding et al., 1986). It was also shown that local provenances are not always superior to imported provenances and are mostly at provenance mean levels. In some cases they are even inferior to the imported provenances (Keiding et al., 1986). Through the provenance (region analysis, the Indonesian provenance is the most attractive provenance in growth and health performance. Conversely, the "African land race" performs very poor especially in stem quality in all teak planting regions (Keiding et al., 1986). The provenance (region matching or breeding zone as recommended by Keiding et al. (1986) is shown in Table 6. Heritability values of certain characters at provenance level have been estimated to understand teak genetic parameters. Among the observed characters, diameter growth (dbh) and stem straightness and clear bole, persistence of stem axis and flowering habit (early and/or late flowering) are strongly inherited (i.e. h2 (0.70) in this species (Harahap and Soerinegara, 1977; Keiding et al., 1986; Kaosa-ard, 1993). Based on this information, it is clearly indicated that gains of these characters can be largely improved through provenance selection. Although teak breeding programmes have operated in many countries, little information about genetic variations at progeny/clonal levels is available. This is due to a lack of progeny and clonal tests at the initial stage of the programme. 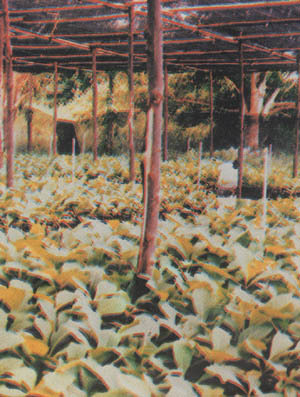 The oldest teak open pollinated progeny test with 21 families was established in 1966 in Tanzania (Person, 1971). At 21 year age, the trial showed that diameter growth (dbh) is the only character which can be detected for genetic variation (Madoffe, 1984) in Wellendorf and Kaosa-ard (1986). Similarly, an early result of open pollinated progeny test (125 families) in Indonesia indicated significant variation only in diameter growth (dbh) (with h2 = 0.36) of the species (Hardiyanto et al., 1992). Based on the Tanzanian information, Wellendorf and Kaosa-ard (1986) demonstrated that a gain in volume production of the plantation can be improved by 15 % through the 25 % backward or family selection. In contrast to results of progeny tests, height growth variation is found to be very significant in clonal tests (Suksileung, 1974; Wellendorf and Kaosa-ard, 1986). Wellendorf and Kaosa-ard (1986) showed an overall clone mean heritability value over two tested sites ("moist" and "dry" sites) in Thailand for height growth of 0.65. There is no strong clone (site interaction within these two different sites. It was also demonstrated that a gain in height growth can be improved by 5 % if 25 % of the best clones are selected for the clonal planting programme (Wellendorf and Kaosa-ard, 1986). Clonal propagation is very essential in the teak breeding and propagation programme. Soon after selection, plus trees are propagated for the establishment of breeding and propagation populations, e.g. clonal test, breeding orchard, clone bank, clonal seed orchard. The most practical technique for propagation of mature teak trees is budding (e.g. stump budding). Under favorable time and nursery conditions, the success of budding can be as high as 100 %. Although teak budding can be done throughout the year, the most suitable time is during the bud break period which is in March-April in the continental regions. With skilled workers, about 100 plants can be propagated per man day. One major disadvantage of using the budding technique is that there are two genotypes (stock and scion) in one plant. Hence, within clone variation in certain characters such as growth and flowering, as shown in clonal tests may be due largely to rootstock and/or rootstock (scion (clone) effects. Moreover a few percentages of stock scion incompatibility in budded plants have been observed in 20-25 year old teak clonal seed orchards in Thailand. To avoid such problems, tissue culture (shoot tip culture) production is another option for mass clonal propagation of teak plus trees or clones. This technique has been developed and commercially used in Thailand (Kaosa-ard et al., 1987; Kaosa-ard and Apavatjarut, 1989). The cost of plantlet production from this technique is not as high as that from improved seed (CSO) (Kaosa-ard, 1990). This is especially so when the cost of improved seed (which includes cost of CSO establishment and maintenance, first flowering and seed production age, seed production capacity and seed production period) and nursery production (e.g. plant percentage) are taken into account. 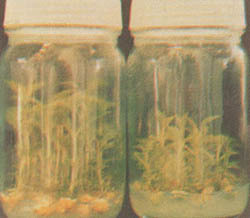 The tissue culture technique for teak clonal propagation has been described elsewhere (Kaosa-ard et al., 1987; Kaosa-ard and Apavatjarut, 1988, 1989). It is seen that the key elements of a tree improvement are the gene resource population, breeding population, propagation population and wood production population. Roles, structures and functions of these populations in the teak improvement programme are discussed. Three main types of teak gene resource populations are classified, according to their genetic structures, in this section. These types are: a) natural populations; b) plantation populations (within the teak region); and c) "land race" or exotic populations. A natural population is the most diverse type of gene resource population. This type must be kept and maintained for its genetic diversity as long as possible. As mentioned previously, there are three identified main regional populations of natural teak. These regional populations include the Indian peninsular population, the continental Southeast Asian (Myanmar-Thai-Laos) population and the insular (Indonesian) population (Hedegart, 1976). Within each regional population, a number of sub-regional populations (Table 7) and local populations (provenances) are also identified, e.g. through international and local provenance testing programmes. Although natural populations are very important in the improvement programme these populations are in the endangered stage throughout the teak bearing region. The population sizes (e.g. the teak forest areas) are decreasing rapidly. This is due to several factors such as encroachment of landless farmers, land settlement allocation, road and dam constructions, etc. Genetic structures of the remaining populations are also degraded and fragmented, mostly due to uncontrolled logging. 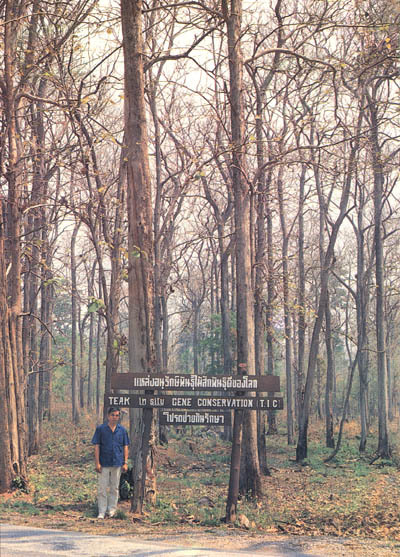 In Thailand for example the teak forest area decreased almost 50 % during the period 1956-1982. That is from 20,000 km2 in 1956 (Loetsch, 1958) to 11,000 km2 in 1982 (Royal Forest Department, 1989) at the rate of 350 km2 per year. This estimate is based on the fact that about 44 % of the mixed deciduous forest (MDF) in the North is teak forest (Loetsch, 1958). In 1989, the Government policy on imposing a logging ban was implemented. As a result, a small part of the teak forest, i.e. 1,700 km2 (which is equivalent to 3,940 km2 of the MDF area), was allocated in protected areas such as national parks and wildlife sanctuaries (Brockelman and Baimai, 1993). The major part of this forest area, which has been left without management, is being degraded and encroached. In Indonesia, which is another case, most of natural teak forests have been managed and converted into pure stands and plantations (Kaosa-ard, 1986; Katasubrato, 1992). As a result, the genetic structure of this population must be more uniform (e.g. through selection and thinning) than the Indian and the continental populations. Regional and sub-regional in situ gene conservation populations are urgently need protection and maintenance for long term breeding, securing valuable genetic diversity and functions. While the natural populations are being depleted throughout the region, the plantation population is conversely increasing steadily. This is especially so in India, Indonesia and Thailand where teak is a high priority planting species. These populations have become to be major gene resource populations in the improvement programme. In provenance studies, it is clearly shown that plantation sources (provenances) perform better, especially in growth, than natural sources (Keiding et al., 1986; Kaosa-ard, 1993). Among regional and sub-regional provenances, Indonesian provenances from plantations grow faster than other provenances, especially where the provenance x region matching is concerned (Keiding et al., 1986). Within the Thai sub-region, it is also clearly shown that plantation seed source is, in all cases, superior to natural seed sources (Keiding et al., 1986; Kaosa-ard, 1993). The superiority of these plantation populations, especially in growth and stem quality, is possibly due to selection and domestication, e.g. selective thinning. Although plantation populations contribute higher gain at the initial stage of selection, natural populations are however very important for long term breeding and selection programme. The area of teak plantation within which populations within the region are listed in Table 8. A "land race" population is one mostly developed from a small quantity of seed or from a small sample of trees, e.g. pilot plantation, provenance trial and species trial. As a result this population is the least genetically diverse population among the gene resource populations. Teak has been successfully introduced in countries since the 1800s (FAO, 1957). Through many generations of domestication, teak has adapted e.g. at least for survival, and developed into a "land race" species in the regions and/or sub-regions (Table 9) for example, the Central American and the African land races. Due to successive generations and selections these "land race" populations have become major sources of genetic material in the regional and sub-regional breeding programmes. The breeding population is a set of individuals (plus trees or clones) of desirable commercial characters. At the initial stage, these individuals are selected from the gene resource populations whereas, in the advanced generations stage they are mostly selected from the existing breeding populations. The breeding population is established mainly to create new individuals of better gain for new breeding and propagation populations. Generally, a set of breeding populations consists of breeding orchard, clonal test and progeny test. Although several breeding methods have been developed, i.e. to maximize gain and to maintain genetic variability of the breeding population, few methods are being used in the teak programme, e.g. simple recurrent selection (SRS), simple mass selection (SMS), simple recurrent selection for general combining ability (SRS-GCA) see Figures 2 and 3 and selection and mass vegetative propagation (MVP). These methods may be operated for a short term seed production or propagation programme or for a long term breeding and propagation programme. In a long term programme, it may be operated as a basic single population programme or as a multiple populations programme (Wellendorf and Kaosa-ard, 1986). However, these teak breeding systems are managed and operated based on the assumption that: a) there is no controlled pollination; b) an open pollinated progeny test at the initial stage is not feasible; and c) mass clonal propagation, i.e. through tissue culture and seedling cutting is applicable. It is well accepted that controlled pollination is the most difficulty part in the breeding programme. As for teak, the pollination technique, at this stage, is still not feasible for a full-sib progeny testing programme. It has been estimated that the maximum capacity of controlled pollination, as developed in Thailand, is 80 flowers per man day (Hedegart, 1976). Of this, only 16 flowers successfully develop into fruits for progeny testing. This is based on the success of hand pollination of 20 % (Hedegart, 1973). This controlled pollination technique consists of emasculation, isolation, pollen collection and hand pollination of individual flowers. Secondly, the amount of seed collected from a plus tree is generally too small and mostly not sufficient for progeny testing. This is especially in the Indian and Continental Southeast Asian Region. Finally, the seed germination capacity is low and, hence, the plant percentage in nursery is very low, i.e. 5-10 %. Based on these biological constraints, it has been estimated that about 100 seedlings can be obtained from 5,000 hand pollinated flowers for the full-sib progeny test. Simple Recurrent Selection (SRS). A SRS, which is the simplest and cheapest breeding method, is widely practised in a short term seed production programme, e.g. in Thailand, India and Indonesia. It involves only selection and establishment of a seed production population, e.g. SPA and CSO (Figure 2). The SPA is a converted natural stand or plantation for seed production purpose. In this conversion, all phenotypically inferior trees are removed and the area is managed for seed collection. The CSO is a clonal plantation which is designed and managed for seed production purpose. Clones used are from budding of plus trees. Hence, the major difference between SPA and CSO is that selection intensity of seed trees in the SPA is lower than plus trees (clones) in the CSO, i.e. 1:6-1:10 for SPA and 1:100-1:1,000 for CSO. In this method, clonal and progeny tests are not essential. This method is most suitable for short term seed production programme. This method is a modified SRS. In each breeding or planting zone, it includes a set of CSO, a set of clonal test (CT) of similar clones to the CSO and a set of open pollinated progeny test (OP-PT) if plus tree seed is adequate for the testing programme (Figure 3). Selection of best families which have shown higher GCA values in the OP-PT, for second thinning in the CSO. An initial clone set used in this programme is 50-100 clones for the establishment of CT and CSO. Similarly, progenies of these clones are allocated in the OP-PT programme. After the first (clonal) thinning, about 25-50 best clones are left for seed production. Seed from these clones are also used for OP-PT in the new breeding population. The main purpose of a long term breeding programme is to generate cumulatively improved plant material as well as to create genetic diversity of the breeding population for as many generations as possible. Multiple breeding populations, designed to manage larger breeding populations, i.e. for larger genetic diversity and gain, have been widely developed. In this programme, a large breeding population (consisting of 200-500 individuals or clones) are divided into a number of smaller breeding populations (e.g. sub-lines or sub-populations) for the breeding operation. There are many breeding systems which have been developed for this multiple breeding populations, such as sub-line breeding system, replicate population breeding system, multiple population breeding system etc. (Namkoong et al., 1980, 1988; Barns, 1984; Wellendorf and Kaosa-ard, 1986; Nikles, 1992). The multiple population breeding system, which seems to be very popular in tropical tree breeding (Barns, 1984; Wellendorf and Kaosa-ard, 1986; Nikles, 1992) has been recommended and used in the teak breeding programme (Wellendorf and Kaosa-ard, 1986). 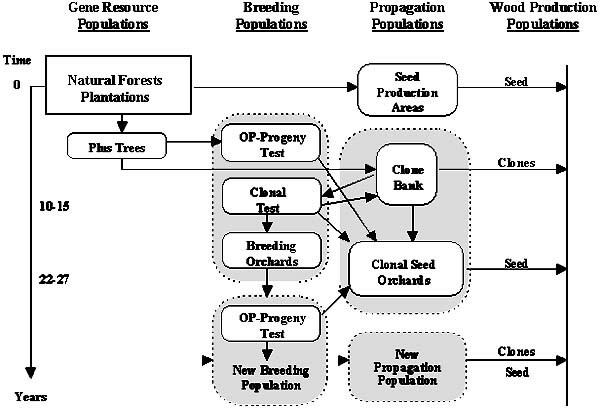 A concept of multiple population breeding system is to divide a large breeding population into a number of sub-populations for different breeding directions and objectives, such as for different breeding/planting zones, environmental adaptability and different products (growth, stem quality and wood quality) (Namkoong et al., 1980, 1988). With teak, the multiple population breeding system has been proposed and operated in Thailand (Wellendorf and Kaosa-ard, 1986). Apart from genetic gain and variability, the main objective of this breeding system is to create the improved material (clones and seed) for different potential planting zones, e.g. from dry to moist planting zones. In this system, a number of sub-populations are created in each planting zone. The number of sub-populations varies depending on availability of resources, genetic diversity, environmental condition and product utilization. In Thailand, for example, 5 sub-populations and 3 breeding and planting zones (i.e. dry, medium and moist zones) have been proposed in the system (Wellendorf and Kaosa-ard, 1986). Each sub-population consists of 100 individuals (clones) and, hence, 500 initial plus trees (clones) are required in this programme. The sub-populations are managed separately for as many generations as possible. These sub-populations may be managed at different breeding directions at the beginning, e.g. for wood quality, for broad range of environmental condition, etc. If inbreeding occurs, the inbred sub-populations will be enriched by adding and/or replacing with some new clones selected from the backup gene resources. 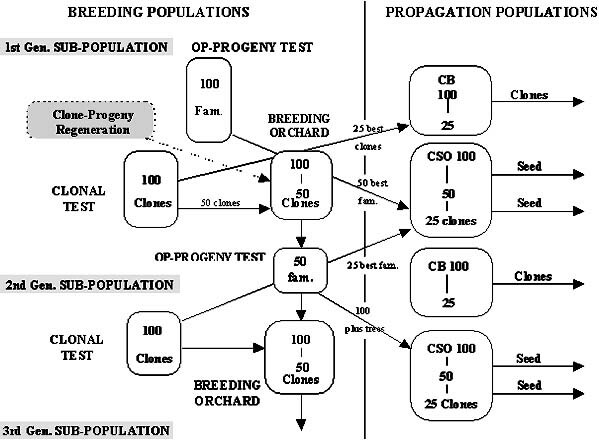 Within each breeding sub-population, a breeding orchard (BO), a clonal test (CT) and a open pollinated progeny test (OP-PT) (if available) of the same set of 100 clones are established (Figure 4 and Figure 5). A production clonal seed orchard (CSO) of these clones is also established in the propagation population section. Clonal and progeny tests are first evaluated at 10-12 years. Their results, e.g. parent offspring regression from the clonal/progeny tests or clonal performance alone from the clonal test, are used as the guide for clonal thinning (e.g. 50 % thinning) in the BO (and also in the production CSO). Remaining clones (e.g. 50 clones) which are higher in breeding values are left for random mating. Thereafter, their OP-PT of 50 families is created as a part of the new generation breeding sub-population. The clonal and progeny tests are re-evaluated (i.e. 10-12 years after the first evaluation), the best clones in the CT and best parents (clones) in the CSO are selected for mass clonal and seed propagation. Wellendorf and Kaosa-ard (1986) estimated that if 25 best parents are left for seed production, the genetic value of plant materials produced from this 25 clone orchard will be 15 % higher than the average genetic value of the initial 100 clones. The propagation population is established and managed for mass production of seed and propagules (e.g. buds, shoots, coppice, meristems). This population is strictly established by using selected plus trees and/or clones from the gene resource populations or derived from the breeding populations, e.g. progeny and clonal trials. In the long term breeding programme, new plus trees of better genetic combination and gain are created throughout the successive generations of the breeding populations. The propagation populations are therefore considerably of short term and dynamic programmes. A teak propagation population includes seed production areas and seed orchards for seed production, clone bank and stock plants for propagule or clonal production e.g. scions, buds and shoots. The major constraints in teak improvement strategies are low seed production, low plant percentage in nursery production and difficulty in controlled pollination. Supportive research and development in these areas are really required. Effects of environmental factors, e.g. climate prior to and during flowering period, soil fertility and fertilizer application, stand age and density, etc., on flowering and fruit setting. Flowering biology in relation to seed production, e.g. flower initiation and development, pollination ecology, fruit growth and development, etc. Effects of leaf defoliators, e.g. Hyblaea puera, on flowering and seed productivity. Effects of insects feeding on flowers and young fruits, such as Pagyda salvalis on seed production. Effects of hormones and other related substances on flowering induction and seed production. Effects of pollination insects on seed production. Physiological dormancy of teak seed. All existing seed pre-sowing treatment techniques are revised and/or retested. Promising techniques be further developed for large scale operation programme, e.g. 0.5 ton of seed per treatment lot. Nursery techniques, as transplanting and lining techniques, i.e. to reduce growth competition and to improve uniformity of nursery seedlings. Pollen collection, handling and storage. Mass isolation and emasculation techniques. Flowering induction techniques, e.g. application of gibberellic acid (GA), growth retardants such as Paclobutrazole and fertilizers such as mono-potassium sulphate (0-52-34), etc. Development of in-house breeding orchard techniques to facilitate breeding operation, e.g. controlled pollination. The strong current interest in vegetative propagation is justified by the outlined difficulties with seed and nursery production. An effective application of tissue culture and/or sprout-cutting of seedlings will support testing and selection in the breeding populations and may be an option for mass clonal propagation for the clonal planting programme. The possibility of mass production of tested individual clones will generally lift the possible performance level of material reaching plantation forestry in the form of clone mixtures in sets of, say 25 clones. Other research urgently needed in association with the teak improvement programme is of wood quality studies. Environmental as well as genetic investigations into variation in those wood properties which are of economic interest should be initiated. Based on these findings it will then be possible to judge if specific wood properties should be included among the breeding objectives. Anon. 1956. India In "Country Reports on Teak Forestry" FAO, Rome 21-48 pp. Anon. 1993. Teak in Indonesia. In "Teak in Asia" Technical Document 1, GCP/RAS/I34/ASB, FORSPA Publication 4, FAO-RAPA 35-40 pp. Banik, R.L. 1993. Teak in Bangladesh. In "Teak in Asia" Technical Document GCP/RAS/I34/ASB, FORSPA Publication 4 FAO-RAPA 1-10 pp. Barnes, R.D. 1984. A multiple population breeding strategy for Zimbabwe. In. "Provenance and Genetic Improvement Strategies in Tropical Forest Trees". Edited by R.D. Barnes and G.L. Gibson, 619-632 pp. Boonkird, S. 1964. Progress report on the first teak tree-show in Thailand. Nat. His. Bull. Siam. Soc. 20: 243-256. Brockelman, W.Y. and V. Baimai 1993. Conservation of bio-diversity and protected area management in Thailand. Proc. of Skill Transfer Workshop conducted by MIDAS Agronomic Co. Ltd., for World Bank/GEF/Pre-investment Study on Conservation Area Protection, Management and Development Project, Bangkok. Bryndum, K. and T. Hedegart, 1969. Pollination of teak (Tectona grandis Linn. f.). Silv. Genet. 18: 77-80 pp. Egenti, L.C. 1981a. Aspect of pollination ecology of teak (Tectona grandis Linn. f.) in Nigeria: Flowering and insect dynamics. In "Proceedings of the Symposium on Flowering Physiology" XVII IUFRO World Congress, Kyoto, Japan. 17-20 pp. Egenti, L.C. 1981b. Aspect of pollination ecology of teak (Tectona grandis Linn. f.) in Nigeria: Viability of reproductive units. In "Proceedings of the Symposium on Flowering Physiology" XVII IUFRO World Congress, Kyoto, Japan. 21-26 pp. FAO 1957. Report on teak growing under exotic conditions. FAO/TSC-57/3, FAO Rome. Gram, K. and S.C. Larsen, 1958. The flowering of teak (Tectona grandis Linn. f.) in aspects of tree breeding. Nat. His. Bull. Siam. Soc. 19: 1-6 pp. Gyi, K.K. 1972. An Investigation of Factors relevant to Development of Teak Plantation in South East Asia with Particular Reference to Burma. M.Sc. Thesis, Australian National University, Canberra Australia. Gyi, K.K. 1993. Teak in Myanmar. In "Teak in Asia" Technical Document GCP/RAS/I34/ASB, FORSPA Publication 4, FAO-RAPA, 51-62 pp. Hardiyanto, E.B., Sunyoto, O.H. Soeseno and M. Naiem 1992. Early performance of teak (Tectona grandis Linn. f.). In "One Century of Sustainable Forest Management with Special Reference to Teak in Java". Proc. International Symposium on Sustainable Forest Management, Yogyakarta, Indonesia. 177-180 pp. Hedegart, T. 1974. The Teak Improvement Centre: Ten years after initiation. Vanasarn 32: 34-356pp. Hedegart, T. 1976. Breeding system, variation and genetic improvement of teak (Tectona grandis Linn. f.). In "Tropical Trees" Edited by J. Burley and B.T. Styles, Linnean Soc. Symp. Ser. No. 2: 109-123 pp. Academic Press, London. Kanchanaburangura, C. 1976. Teak (Tectona grandis Linn. f.) Seedlings and Provenance Variation M.Sc. Thesis, Australian National University, Australia. 216 p.
Kaosa-ard, A. 1986. Teak (Tectona grandis Linn. f.) nursery with special reference to Thailand. DANIDA Forest Seed Centre Seed Leaflet No. 4A 42 p.
Kaosa-ard, A., P. Apavatjrut and T. Paratasilpin 1987 Teak tissue culture. In Proceedings of His Majesty's Fifth Cycle Commemorative Conference of USAID Science Research 201-206 pp. Kaosa-ard, A. and Apavatjrut, P. 1988. Teak tissue culture: Rooting and transplanting techniques. In Biotechnology Conference, Washington D.C.
Kaosa-ard, A. and Apavatjrut, P. 1989. Teak (Tectona grandis Linn. f.) tissue culture. In Regional Symposium on Recent Research Development in Tree Plantation for Humid and Sub humid Tropics of Asia, in Malaysia, June 5-9, 1989. Kaosa-ard, M. 1990. Teak Tissue Culture: Cost Analysis Report RFD/CMU/PSTC 1990 26p. Katasubrato, Y. 1992. The history of sustainable management in Indonesia, the case of teak. In "One Century of Sustainable Forest Management with Special Reference to Teak in Java" 3-39 pp. Keiding, H., H. Wellendorf and E.B. Lauridsen 1986. Evaluation of an International Teak Provenance Trials. DANIDA Forest Seed Centre, p. 81. Kumaravelu, G. 1993. Teak in India. In "Teak in Asia" Technical Document GCP/RAS/134/ASB, FORSPA Publication 4, FAO/RAPA 51-62 pp. Meekaew, P. 1992. Genetic Variation in Growth, Seed Production and Foliar Nutrients of Teak. M.Sc. Thesis, Faculty of Forestry, Kasesart University, Bangkok, Thailand 73p. Namkoong, G.; Kang, H.C., and Brouard, J.S. 1988. Tree Breeding Principles and Strategies. In Monographs on Theoretical and Applied Genetics 11, Springier-Verlag 180p. Nair, K.R. and Mukerji, H.K. 1960. A statistical study of the variability of physical and mechanical properties of teak grown at different localities of India and Burma and the effects of variability on the choice of sampling plan. Ind. For. Rec.1: (1). Nikles, K.G. 1992. Conservation and use of genetic diversity in improvement programmes with industrial forest tree species. In "Proc. of the Regional Symposium on Recent Advances in Mass Clonal Propagation of Forest Tree for Plantation Programmes" RAS/91/004 Field Document No. 4 83-109 pp. Royal Forest Department (RFD), 1989. Forestry Statistics of Thailand. Siripatanadilok, S. 1974. Development of teak flower (Tectona grandis Linn. f.). For. Res. Bull. No. 31, Fac. Forestry, KU, Thailand 68p. Srimathi, R.A. and C.J.S.K. Emmanuel 1986. Jour. Trop. For. 2: 256-268. Suangtho, V. 1980. Factors Controlling teak (Tectona grandis Linn. f.) Seed Germination and Their Importance to Thailand. M.S. Thesis Australian National University, Canberra, Australia. Suksileung, P. 1975. Clonal variation and inheritance in growth characteristics of teak (Tectona grandis Linn. f.). M.Sc. Thesis, Fac. Forestry, Kasetsart University, Thailand 45p. Tewari, D.N. 1992. 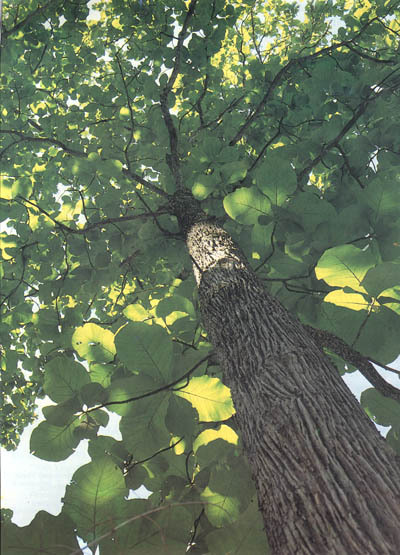 A Monograph on Teak (Tectona grandis Linn. f.), Int. Nat. Book Dist. Dehra Dun, 479p. Wellendorf, H. and A. Kaosa-ard, 1988. Teak Improvement Strategy in Thailand. Forest Tree Improvement No.21, p.43. White, K.J. 1991. Teak: Some aspects of research and development. FAO/RAPA 1991/17 Bangkok. A genetically superior teak (plus tree) is carefully preserved. Lampang, Thailand. 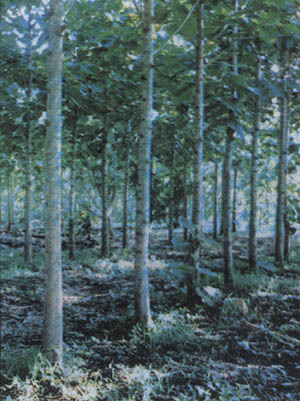 Elite clones of teak were selected by the Royal Forest Department. Meristematic tissues from these plus trees were excised from the mother trees, surface sterilized and cultured onto defined aseptic medium. When the tissues multiplied to a desirable quantity, they were successfully transplanted into a soil mix medium and after 2-3 months were transferred to the field. Growth of tissue cultured plants appeared to be faster and more uniform than those from seed or stumps derived from seeds. Tissue cultured plants furthermore have fewer branches and side shoots than seed based plants. Over 500,000 tissue cultured plants have been field established in the past four years. Some planted nine years ago have shown very satisfactory growth. Volume and income projections of tissue cultured plantations are calculated. Key words: Tectona grandis, Thailand, clones, micropropagation, commercial tissue culture. Teak (Tectona grandis) is indigenous to continental Asia and is confined to the moist and dry mixed deciduous forest below 1,000 m altitude in India, Myanmar, Thailand and Lao (FAO, 1991). 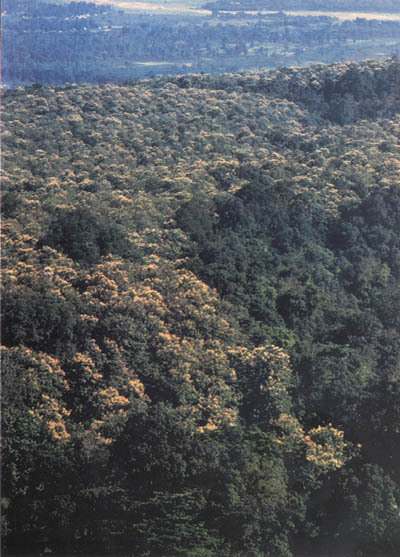 The teak forest has been diminishing year after year. For example, Thailand had nearly 100 million rai (16 million ha) of teak forest before, but now has less than 1 million rai (160,000 ha). Teak wood was the main export item 35-50 years ago, but now Thailand has become a major importer of teak. The rapid decline of teak forest elsewhere has been very obvious due to the high demand of teak wood which is reflected in the ever increasing price. Teak is widely planted between the latitudes of 28°N and 18°S in Asia and the Pacific Region, as well as in Africa and Latin America. Indonesia has established teak plantations over 1,000,000 hectares. Planting teak in the tropical evergreen forest zones is getting popular, where teak does not naturally exist. Teak has been artificially regenerated by: direct sowing of seed, seed broadcasting, seedling transplant and stumps (derived from seed). Traditionally, seed was collected from plus trees, but unfortunately these plus trees have become rare due to heavy felling practices in the past. Though seed orchards have been promoted recently, the amount of seed produced is still below demand. Consequently, seed has been collected from genetically inferior parent trees, and this guides the increase of poor quality teak in plantations. Clone planting was not common up to the recent past because clonal cultivation materials were very difficult to obtain. Budding, grafting and cutting techniques have been successfully developed but applied only to a limited extent. These methods have been employed to multiply plus trees for seed orchards. The successful development of large-scale commercial tissue culturing of teak in Thailand in the past 3-4 years has opened up new horizons for clonal plantations of teak in the Region. Laboratories in India, Indonesia and Thailand have reported tissue culturing of teak with various degrees of success. Gupta, et al. (1979) reported multiple shoot formation from excised seedling explants and from 100-year old trees. Small quantities of some 50 plants were obtained from tissues excised from mature trees. Noerhadi and Wirjodarmodjo (1980) reported research on teak tissue culture in Indonesia. 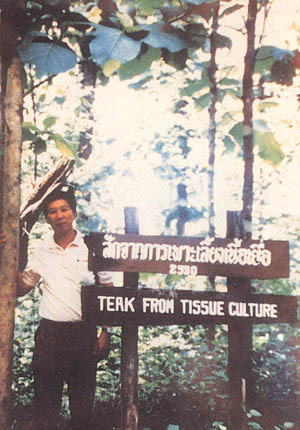 Kaosa-ard (1990) reported successful development of teak tissue culture in Thailand. Field planting has also been reported, but to a limited extent. Mascarenhus et al. 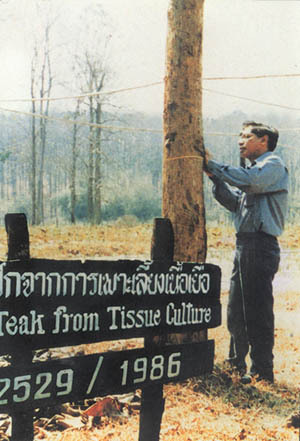 (1988) observed field data from teak tissue cultured plants in India, while Kaosa-ard observed satisfactory field data from tissue cultured plants planted in 1986. Thai Orchids Lab Co., Ltd. in cooperation with the Royal Forest Department and Chiangmai University has successfully developed tissue culture techniques from mature teak trees at a commercial scale. Selection of elite clones: The Royal Forest Department, Thailand, has made selections of elite clones from various forests over the country in the past 30 years. Selection criteria, locations of the trees and their characteristics were systematically recorded. Clones of selected trees were made by grafting and these were planted in germ plasm plots; to the present, 480 elite teak clones have been selected. Table 1 illustrates examples of those elite trees. 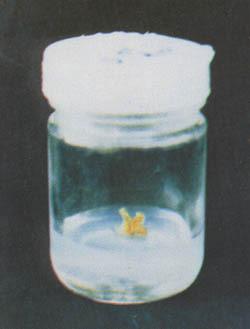 Tissue culture procedure: Shoot tips and lateral buds of mature selected trees are excised, surface sterilized and cultured onto the defined aseptic medium (Photo 1). After explants are free of microorganisms and become established, tissues were then cultured on a multiplier medium to speed up the multiplication rate (Photo 2). Shoots are excised and rooted on the rooting medium and then transplanted into a soil mix medium in the nursery (Photo 3). Plantlets grown to a height of 25-30 cms (Photo 4) are ready for field planting. Field planting: Tissue cultured plants are planted in the traditional manner of transplanting seedlings. A hole of 30-50 cm square, filled with compost and topsoil is recommended. The spacing (2 to 4 meters between rows and between plants (is normally practiced in Thailand. Trees are planted in the early rainy season (late April) with irrigation supplement during the dry season (October to February). Fertilizer is given 1-2 times a year. Pest management and weed control are applied when necessary (Photo 5). Growth: Tissue cultured plants grow rapidly and uniformly in suitable conditions, the girth growth is around 15 cm (gbh) annually. Photo 6 shows plants 4.5 months old; Photo 7 plants are 9 months old with notable uniformity; Photo 8 shows 1 year old plants of average 15 cm gbh. Photo 9 shows plants 1 year and 5 months old with average gbh 21 cm and the uniformity is almost perfect; Photo 10 shows 3.6 years old tissue cultured teak of average 39 cm gbh; Photo 11 shows 5 year old trees and Photo 12 is 9 years old. The 5 and 9 years old trees are of limited number and are in natural environment. Their growth rates are 50 cm and 68 cm gbh respectively which are quite acceptable, but still slower compared with well managed plantations. Yield benefit: It is estimated that at least 25-30 % higher yield is be obtained by using select parent tissue cultured plants. At 15 years rotation, a simple comparison between plants from select tissue culture parents and plants from seed is shown in Table 2. 4) Unit price for below standard wood is 50%. The expected income at 15 years using tissue cultured plants is US$168,000 per hectare whereas the income of plants from seed is US$79,800 (50,400 + 29,400), a difference of US$ 88,200. In other words, the economic gain using tissue cultured plants over those from seeds is US$88,200 per hectare, while the investment costs of clonal materials is only US$315 more than from seed plants. Management benefit: Tissue cultured plants grow straight with fewer branches and require less labour for pruning. In addition, as tissue cultured plants grow uniformly, plantation management is easier. Mascarenhus A.F., Khuspe, S.S., Gupta, R.S. and Khan, B.M. 1988. Potential of Cell Culture in Plantation Forestry Programmes. In: Genetic Manipulation of Woody Plants. Plenum Press, New York. Noerhadi, E. and Wirjodarmodjo. 1980. Vegetative Propagation of Tectona grandis and Pinus merkusii Using Tissue Culture. Duta Ramba 6 (42) Inst. of Technology, Bandung, Indonesia. Kaosa-ard, A. 1991. Country Report of Teak in Thailand. China/ESCAP/FAO Regional Seminar on Teak. Guangzhou, China. White, K.J. 1991. Teak: Some Aspects of Research and Development. RAPA Publication 1991/17. FAO, Regional Office for Asia and the Pacific, FAO, Bangkok. Photo 1. Shoot tips from mature elite clones of teak cultured onto a defined aseptic medium. Photo 2. Multiplying stage of tissue cultured teak. Photo 4. Tissue cultured teak plants, 25-30 cm tall. Photo 6. Tissue cultured teak plants, 4.5 months old. Photo 7. Tissue cultured plants, 9 months old. Photo 8. Tissue cultured plants, 1 year old. Photo 9. Tissue cultured plants, 1 year and 5 months old. Photo 10. Tissue cultured plants, 3 years and 6 months old. Photo 11. Tissue cultured plants, 5 years old. Photo 12. Tissue cultured plants, 9 years old. Teak is the most preferred hardwood species in tropical plantation forestry. Teak plantation technology under low input is well-known; however, a system of quality control is lacking. At the same time, performance of plantations under high input management remains under-investigated. The scarcity of superior propagules, delayed planting, and sub-optimal after-care have adversely affected the productivity of plantations in the government sector in India. On the other hand, overenthusiasm for high inputs in terms of fertilization and irrigation, especially in the private sector, might lead to increased damage by pests and diseases, and low prices. The fundamental principles guiding site selection are often ignored especially in the private commercial sector. The information on underplanting and mixed planting is not adequate or encouraging enough to provide guidelines for establishment of polyculture teak plantations. The paper attempts to discuss various issues involved in teak plantation management and suggests alternatives for ensuring quality. Key words: Tectona grandis, India, plantations, quality control, inspection, research. Teak (Tectona grandis Linn.f. ), an important timber species of worldwide reputation (Banik, 1993) has indigenous distribution in Peninsular India, Myanmar, Thailand and Laos. It is believed to be an early introduction in Java (White, 1991). Outside its natural habitat, it is cultivated in South and South-East Asia, the Pacific, Africa, the Caribbean Islands, South America and Central America (Tewari, 1992), accounting for 14% of tropical forestry plantations (Evans, 1982). Although systematic planting and management of teak dates back to the 1840s, a number of problems have been identified in maintenance and improvement of productivity in plantations. The commercial interest in shortening rotation may complicate management practices for want of enough growth data under high fertilizer and irrigation inputs. Apart from this, the impact of intensive high input forestry on sustainable production is also not clear. This paper reviews the traditional plantation techniques and highlights various issues associated with management and productivity of teak in plantations. Teak forests are regenerated artificially, except in the dry teak forests, which are worked under a coppice system, or for the moister forests where the advance growth is cut back to form the new crop. The common practice is to raise new crops using root-shoot cuttings (stumps). This procedure has been going on for over a century in India. Various techniques of artificial regeneration have been more or less standardised, although there is scope for further improvement. More than knowledge about correct technique, a correct programme of work and its execution according to schedule is critical (Tewari, 1992). 'Seeds' (technically fruits) are collected from the ground as and when they fall during January and February. The bladder-like calyx is removed by vigorously rubbing it inside a gunny bag. The seeds are then cleaned by winnowing. Seeds store well in gunny bags or sealed tins for 2-3 years. The stony hard pericarp poses a problem for quick and uniform germination. In order to hasten germination, various pre-sowing treatments have been developed. Some of the beneficial treatments include: 1) alternate soaking in water and drying for 24 hours each for two weeks; 2) immersing the seed in water for a number of days; 3) soaking the seed in a mixture of cowdung for a period up to one week; 4) putting the seeds in alternate layers of seed and sand in a pit with daily watering for 7 days, and then drying and storing till time of sowing; and 5) spreading the seed in a 10 cm layer in the sun on a mat or cement platform and watering constantly until commencement of germination. Well-drained sandy loam with gently sloping terrain is recommended for preparing nurseries. Each bed is of 1.2 m (12 m size, spaced at 0.3 m to 0.6 m between beds and 0.6 m to 1.6 m between rows of beds. Each bed produces about 400-800 plantable stumps. The ground is ploughed and the area of the bed is dug out to a depth of 0.3 m. Roots, stumps and stones are removed. The clods of earth are broken fine. The soil is allowed to weather for about a month and then filled into the nursery bed with sand and organic matter. However, when temporary nurseries are established in forest areas rich in nutrients, no additional manurial inputs are necessary. In moist localities the beds are raised to a height of 30 cm from ground level to prevent water logging. In dry zones, beds are made flush with the ground level. In very dry localities, with a mean annual rainfall of 750 mm or less, slightly sunken beds give better results. The seed rate per standard bed of 12 m (1.2 m varies from 3 kg to 12 kg. At Nilambur in Kerala, about 5kg of seeds are commonly used. Both broadcast sowing and line sowing or dibbling 5-10 cm apart are practiced. Line sowing or dibblings have greater seed economy and better survival and growth. Beds normally do not need any overhead shade. Irrigation is not provided except in very dry areas. Beds are maintained free of weeds. The site for planting may be either plain or gently sloping with excellent drainage. Soils derived from gneisses, schists and trap are good for teak. Alluvial sites are superior for teak growth while laterite or lateritic gravel as well as clays, black cotton, sandy and gravely soils derived from sandstone are not good for teak plantations. After removal of saleable material, the site is given a burn to dispose of the slash and improve access and fertility. A study conducted by the Kerala Forest Research Institute (KFRI) indicates that slash-burning does not help to improve the growth of teak beyond the first year (Chacko et al., 1991). Stump (a root-shoot cutting) planting is the popular method of raising plantations. Stumps with a 1-2 cm diameter (at the thickest part, referred to as 'stump thickness') prepared out of one-year-old seedlings are planted in holes made with a crowbar. In dry localities, where rainfall is less than 900 mm, pre-sprouted stumps raised in polythene containers a few months in advance give satisfactory results. Direct sowing and transplanting of bare-root seedlings, though practiced in some areas, do not give satisfactory results. Stumps are planted in crowbar holes and generally buried up to the collar. In drier localities stumps are planted flush to the ground. In hard soil, it is practiced to plant stumps in pits of 30 cm deep and 15 cm diameter. Although spacings of 1.8 m (1.8 m to 3.6 m (3.6 m are practiced in different regions, 2 m (2 m is the most common. Weeds, especially grasses, retard teak growth and therefore are managed below the level of competition either by fork weeding, scrape weeding, uprooting or knife cutting at ground level. The number and intensity of weedings vary with the intensity of weed growth. Intercropping in teak plantations (termed as 'taungya') during the initial two years of planting is a common practice where there is a demand for cultivatable land. Once the plantation area is leased out, the cleaning of the site, burning, staking and planting are done by the lease holders. The common intercrops are paddy, chillies, maize, wheat, sesame and various vegetables. Crops such as sugarcane, wet rice, plantain, jute, cotton, or creeping vegetables such as pumpkin and cucumber are not allowed. During the growth of the field crop, the weeding and tending of teak are done by the lease-holding farmers. However, in certain regions the practice of 'taungya' has been discontinued for reasons of soil degradation and suppression of teak (Alexander et al., 1980). Generally two to four weedings a year are required in plantations during the first three years. Scrape weedings can effectively control weeds. Cleaning is done in areas where bamboo forms the main understorey. Thinning prescriptions vary from one locality to another. Unfortunately, it is often governed by revenue rather than silvicultural considerations. In a good quality plantation, managed on a 50 year rotation, the thinnings are carried out at the fourth, eighth, 12th, 18th, 26th and 35th years. Thinning schedule varies with site quality. In better plantations the thinnings are done early as compared to poor plantations. The first two thinnings in plantations with an initial spacing of 1.8 m (1.8 m or 2 m (2 m are mechanical wherein 50 % of stock is removed in each thinning. Alternate diagonals in the first thinning, and alternate rows in the next are thinned. Climber cutting and cutting back of overtopping bamboos and other species are done during the early thinnings. Data from ideal teak growing tracts shows that yields obtained in plantations are far below expectation (KFRI, 1979). Site deterioration in teak plantations has been reported by Champion (1932), FRI&C (1929, 1934, 1941), Seth and Yadav (1959), and Jose and Koshy (1972), and also widely observed in the field. Usually the site quality for teak plantations is assessed by the height (technically 'top height') of trees (Chaturvedi and Khanna, 1994), but this alone does not necessarily reflect the soil conditions. Site deterioration is attributed to several factors, such as: 1) a lack of efficient technical supervision because of a rapid expansion of plantation areas; 2) the soil deterioration caused by intensive commercial taungya cultivation; 3) delayed planting; and 4) poor after-care. A survey on teak plantations in Kerala of all age groups up to 60 years indicated a decline of site quality with age (Jayaraman, 1995). It could be argued that this is a reflection of decrease in site quality within a rotation. The compound annual rate of decline works out to 1.6% (K. Jayaraman, pers. commn.). The quality of teak stumps (root-shoot cuttings) recommended for planting is specified by its diameter at the thickest part (1-2 cm), referred to as 'stump thickness', and their length (15-20 cm). The stumps should be relatively straight and prepared from one-year-old seedlings. A recent survey of 36 nurseries in Kerala carried out by the author and colleagues revealed that the number of standard plantable stumps produced per nursery bed varies between 74 and 808 (most of the beds gave around 300) as against the expected number of 1000 per bed. Tewari (1992) reports a figure of 600-800 from Andhra Pradesh. Important reasons for such low figures are poor site selection and nursery preparation, the use of poor seed, and delayed nursery operations combined with pest and disease problems. The quality of seeds used in nurseries is of utmost importance (FAO, 1985). Important management operations, such as weeding, cleaning and thinnings, are often delayed because of the unavailability of funds in time and a lack of interest among officers, who are not payed well for carrying out these tasks. Occasionally, thinning operations are delayed deliberately in order to harvest larger poles at a later stage, ignoring possible setbacks in the future. Moreover, field operations are often constrained by the high authority that pays attension only to financial audit but does not give credit to the quality of the plantations raised (Chundamannil, 1993). Field inspections, which had greatly contributed to the quality of plantations in earlier days, have been mostly confined to office inspections (Madhava Menon et al., 1986). The periodic monitoring of plantation performance is a necessary activity for guiding plantation forestry on a sustained yield basis. At present, however, there is no mechanism to ensure systematic and regular plantation monitoring, through which the productivity of plantations are measured and recorded. An analysis of 626 pieces of literature that have appeared in Forestry Abstracts, Indian Forester, Myforest, Forest Ecology and Management, Indian Journal of Forestry and the bibliography in Tewari (1992) during the 10 years from 1985 to 1994 indicates that only 13.7% of the papers deal with the silviculture of teak (Table 1). Also, the same survey indicates that nearly half of them are on seed and nursery (Table 2). It is obvious that other silvicultural subjects, such as planting methods, spacing, thinning and polycultures, have received much less attention. Seeds used in nurseries should be quality-tested, size-graded and certified. A seed certification scheme should be evolved for this purpose. In order to produce good seeds, enough seed stands should be designated and maintained. Clonal seed orchards using scion from plus trees should be expanded. A certification programme for the stumps to be planted will also improve plantation quality. Experiences in the past clearly indicate the importance of field inspections by senior technical officers. There is an urgent need to reemphasise it. A written report of each inspection may be prepared and forwarded to the officer in charge of the plantation and the technical head for implementation of recommendations. A format for reporting inspections is suggested in Appendix 1. Such technical reports are all the more important in recent contexts where working plan reports have mostly become defunct documents (Chundamannil, 1993). The frequency of field inspections could vary depending on the age of the crop, with more frequent inspections in younger plantations. A continuous monitoring system to assess the condition of the crop, especially the site quality at different points of time, will help in scheduling tending operations according to requirements. A central monitoring unit can carry out this task with local assistance. Interim thinning, final felling and other tending operations should be made on this basis. The investment requirements for teak plantations are generally low in relation to the revenue realised through thinnings and final harvest (FAO, 1985; Chudamannil, 1986). Therefore, expenditure on proper maintenance of plantations is fully justified in the long term. Hence adequate funds should be made available in time for tending operations. The problem of inadequate wage rates approved in the government sector could be solved in two ways. Firstly, there should be some freedom vested with the controlling officer to revise wage rates to match the prevailing local rates. An alternative is to award the work by competitive bidding, in which case the contractors will make the initial investment and be reimbursed on satisfactory completion of work, as is done in other government departments. Silvicultural knowledge, especially in less investigated areas such as thinning, pruning and fertilization, needs updating. Information on mixtures is also inadequate. Our experience with mixtures of Ailanthus tryphysa and Evodia lunuankenda are not encouraging (FAO, 1985). Bambusa arundinacea grows well in teak plantations but replaces teak in the long run. Interplanting teak with horticultural crops such as cocoa and pepper also did not yield encouraging results. Therefore, more research needs to be carried out on these important aspects. Comprehensive guidelines for site selection and optimum input use for different regions will be helpful. Many of the scientific publications or reports are not in a form readily usable at the field level. There should be a mechanism by which such information can be collated, simplified, and made available for field use. Long term silvicultural experiments need to be taken up by research institutions in collaboration with forest departments. Most of the traditional plantation techniques hold good even now; however, scarcity of good planting materials, as well as non-availability of funds in time, are problems. Lack of a proper quality control and monitoring system leads to poor establishment and maintenance. Site deterioration between and within rotations poses a threat to potential yields. Adequate measures such as quality control in planting materials and post-planting care have to be taken. Field inspections and centralised monitoring systems can help in assessment of the condition of the plantation and facilitate timely management decisions. Silvicultural research, especially on thinning, optimum inputs, and polycultures needs strengthening. The involvement of both user agencies and research organisations in long term field trials is suggested. The author gratefully acknowledges FORSPA (FAO), Bangkok, for providing financial support, Dr. C.T.S. Nair, Senior Programme Advisor, FORSPA, for suggesting the investigation of this problem, and Dr. K.S.S. Nair, Director, KFRI for encouragement in preparing the paper. Alexander, T.G. Sobhana, K., Balagopalan, M. and Mary, M.V. 1980. Taungya in relation to soil properties, soil erosion and soil management. KFRI, Peechi. Banik, R.L. 1993. Teak in Bangladesh. In: Wood, H. 1993. Teak in Asia. Proceedings of the China/ESCAP/FAO Regional Seminar on Research and Development of Teak, 1991, pp 1-10, FAO, Bangkok. Chacko, K.C., Sankar, S., Pandalai, R.C., and Nandakumar, U.N. 1991. Effects of slash-burning on soil properties and growth of teak. Indian Forester 117:237-248. Champion, H.G. 1932. The problem of pure teak plantations. Forest Bulletin No. 78, Silviculture Series, Government of India Press, Calcutta. Chaturvedi, A.N. and Khanna, L.S. 1994. Forest mensuration (2nd ed.). International Book Distributors, Dehra Dun, India. Chundamannil, M. 1986. Pattern of investments in forestry and its implications on sustained yield management in Kerala. M.Phil dissertation, Centre for Development Studies, Trivandrum. Chundamannil, M. 1993. History of forest management in Kerala. Kerala Forest Research Institute, Peechi. Evans, J. 1982. Plantation forestry in the tropics. Clarendon Press, Oxford. FAO. 1985. Intensive multiple-use forest management in the tropics. FAO Forestry Paper 55, FAO, Rome. FRI&C. 1929. Proceedings of the Third Silvicultural Conference. Government of India Press, Calcutta. FRI&C. 1934. Proceedings of the Fourth Silvicultural Conference. Government of India Press, Simla. FRI&C. 1941. Proceedings of the Fifth Silvicultural Conference. Government of India Press, Dehra Dun. Jayaraman, K. 1995. Structural dynamics of teak stands in Kerala. Final Report (draft) of Research Project KFRI 147/92. Jose, A.I. and Koshy, M.M. 1972. A study of the morphological, physical and chemical characteristics of soils as influenced by teak vegetation. Indian Forester 98:338-348. KFRI. 1979. Yields from teak plantations in Kerala. Kerala Forest Research Institute, Peechi. Madhava Menon, T., Hari Singh, Sharma, Y.M.L., Nair, K.K., Nair, C.T.S., Hassankutty, A. and Sivarajan, M. 1986. Forest policy and management in Kerala. Report of the High Level Expert Committee. Government of Kerala, Trivandrum. Seth, S.K. and Yadav, J.S.P. 1959. Teak soils. In: Proceedings of All India Teak Study Tour and Symposium, Dehra Dun, PP. 121-138. Tewari, D.N. 1992. A monograph on teak (Tectona grandis) Linn.f. International Book Distributors, Dehra Dun, India. White, K.J. 1991. Teak: Some aspects of research and development. FAO, Bangkok. A Regional Workshop on Species Improvement Networks (SPIN), held in Chiang Mai, Thailand, during July 1994, selected seventeen priority species networks under FORTIP. The Workshop concluded the following: all networks should be decentralised; activities should be jointly initiated and organised by the co-ordinating center and FORTIP; networks should seek support from and work closely with related projects or institutions; FORTIP would support networks from its budget; clear commitments of member networks to establish, maintain and assess provenance trials are needed; public or private sector resources will be required for sustainable networking. The Workshop selected one priority species group for each co-ordinating center/country. To facilitate fast action, the FORTIP Secretariat listed activities for immediate action (e.g. seed and propagule exchange is an activity for early implementation); Participants should respond to proposed activities as soon as possible. Tables show the Co-ordinating Centre with priority species and a Timetable and Work Plan for Tectona grandis. Key words: Tectona grandis, network, SPIN, Thailand, improvement, FORTIP. Following the first two years of its operation, the UNDP/FAO Regional Project on Improved Productivity of Man-Made Forests Through Application of Technological Advances in Tree Breeding and Propagation (FORTIP (RAS/91/004) has laid the basis for regional activities in forest tree improvement by setting up an efficient Regional Network among ten member countries in South and Southeast Asia. At the same time, National Networks in each country have been promoted for the success of the Regional Network. In order to further boost the regional activities, the Project Advisory Committee in its second meeting during 24-29 October 1993 in Manila, decided to establish the Species Improvement Networks (SPINs) of 17 priority species or species groups which were previously selected by member countries of FORTIP. A Regional Workshop on Species Improvement Networks (SPINs) was held during 25-30 July 1994 in Chieng Mai, Thailand, jointly organized by the Royal Forest Department of Thailand (RFD) and FORTIP. It aimed to operationalise the SPIN idea, to reach a consensus on activities to be launched, and to initiate practical work. Nine representatives from FORTIP member countries attended the Workshop: Bangladesh, Bhutan, India, Indonesia, Malaysia, Nepal, Philippines, Sri Lanka and Thailand. Participants and resource persons from the following agencies and projects also joined the Workshop: ASEAN Forest Tree Seed Centre (AFTSC), the CSIRO Division of Forestry - Australian Tree Seed Centre (ATSC), the International Network for Bamboo and Rattan (INBAR), the International Plant Genetic Resources Institute (IPGRI), the Oxford Forestry Institute (OFI), the Regional Community Forestry Training Centre (RECOFTC), the Universiti Pertanian Malaysia (UPM), the Center for International Forestry Research (CIFOR), the Royal Forest Department of Thailand (RFD), members of FORTIP's National Network in Thailand, and a representative of the Forestry Department of the Food and Agriculture Organization (FAO), Rome. Experiences in Forest Tree Improvement and Networking were shared and discussed among the more than 30 participants in the Workshop. Action plans were made up by two working groups during technical sessions for most of the 17 priority species or species groups. The plans were discussed and approved at the final session. The main output of this workshop was the formation of 17 species networks of priority species selected by FORTIP member countries. The main expected outputs and activities of these networks were discussed in two working groups in which the main outputs and activities were defined for each species or species group; an activities timetable was prepared; and participating countries, a co-ordinating centre, and possible collaborating institutes were identified. During the final plenary session these outputs and activities were approved. The FORTIP secretariat was authorized to incorporate the results of the discussions in the conclusions and recommendations at the plenary session. 1. The organization of all species networks will be decentralized during the installation period. Participation of the countries in network activities will be on a voluntary basis. The interest of the concerned countries in regional co-ordinated activities is the principal motivation for the establishment of SPINs. This attitude will contribute to the sustainability of the networks. 2. The activities will be jointly initiated and organized by a co-ordinating centre and the FORTIP Secretariat. The FORTIP Secretariat will be involved in the co-ordination of all activities until the termination of the project. Responsibility for network activities will be shared by the co-ordinating centre and the FORTIP Secretariat. To ensure the sustainability of the networks, responsibility will be gradually transferred to the co-ordinating centre prior to termination of FORTIP. 3. The proposed networks should seek support from and work closely together with related projects or institutions. The list of possible collaborating agencies/countries attached to each species does not necessarily indicate experience with the FORTIP networks. 4. The activities will be reviewed at the next Project Advisory (PAC) Meeting of FORTIP, scheduled for December, 1994, in Sri Lanka. Necessary modifications or refinements of organizational aspects, prioritization of species and activities, etc., will be discussed at this meeting. 1. FORTIP will initially support the proposed SPINs from its regular budget, e.g. by providing funds for seed exchange activities, workshops, study tours and publications. 2. For most of the proposed networks, clear commitments of resources by individual network members, e.g. the commitment to establish, maintain and assess a provenance trial, are needed. Additional funding will also become necessary for some networks in order to accomplish all proposed medium and long term activities. The co-ordinating centre and the FORTIP Secretariat will prepare proposals to attract additional funding from outside sources and discuss the proposals with all participating countries. 3. Public or private sector resources will be required for sustainable networking. FORTIP should survey the prospects for more private sector involvement in the SPINs. 4. A round table discussion with participants from all FORTIP countries and possible donor agencies is regarded as useful to attract external assistance. It is tentatively scheduled for 1995. The number of proposed networks was regarded as being too large to initiate work simultaneously. Thus, it was agreed to prioritize one species group for each co-ordinating centre/country. Consensus was reached on prioritisation as shown in Table 1. A specific recommendation was made by the Workshop regarding the FORTIP training programme. Basic tree improvement activities are often hampered by difficulties in seed collection. Seed collection in Paraserianthes spp. was mentioned as an example. FORTIP should promote practical training for seed collectors, e.g. by organizing and sponsoring a training course. The Gesellschaft fur Technische Zusammenarbeit (GTZ, Germany), DANIDA Forest Seed Centre (DFSC), Australian Tree Seed Centre (ATSC) and ASEAN Forest Tree Seed Centre (AFTSC) were mentioned as a possible partners for these activities. This is regarded as essential for the success of the proposed SPINs. Exchange of information will be the main activity in most networks. This implies both exchange of views among scientists as well as exchange of genetic information via shipment of seeds and propagules. In order to facilitate fast action, the FORTIP secretariat has listed activities for immediate action in a separate table for each species and species group (an example on teak follows). Exchange of genetic material via seeds and propagules is among the activities which can and should be initiated soon in order to "make the network work". All participating countries should respond to the proposed activities, (i.e. the proposed exchange of materials) as soon as possible, giving details both on the kind of material they can provide and what they would like to receive from the network. If applicable, countries should also mention assistance required for these activities. 1. The assessment should follow the standardized procedure of Kieding, H., Willendorf, H. and Lauridsen, E.B. : Evaluation of an international Series of Teak Provenance Trials. DANIDA Forest Seed Centre. 2. Provenance selection should be based on an evaluation of growth and yield, stem form, and wood quality. 3. The use of results of provenance tests for the production of high quality planting material must be promoted. The proposed Species Improvement Network for Teak is an opportunity to revitalise the activities of the Teak Network. The improvement work will be co-ordinated with any future activities of this Network. Thailand qualifies as a co-ordinating centre due to its long experience in growing and breeding teak. Participating countries: Bangladesh (BGD), Bhutan (BHU), India (IND), Indonesia (INS), Malaysia (MAL), Nepal (NEP), Philippines (PHI), Sri Lanka (SRL), Thailand (THA). THA, FORTIP: consult DANIDA regarding the evaluation of international provenance tests. THA, FORTIP: prepare and distribute guidelines for the establishment and maintenance of SPAs and plus tree selection of teak. BGD, BHU: explore the feasibility of seed collection and regional seed exchange among member countries, giving details about the kind and quantity of material available for dispatch from each country and the interest of each country in regional seed exchange (i.e. which material would the country like to receive?). If applicable, state the earliest time of seed dispatch and the kind of assistance required for exchange activities. Inform the co-ordinating centre and the secretariat as soon as possible on any matters regarding the exchange of genetic material. THA, FORTIP: identify collaborating agencies and possible donors for a study on teak in natural populations, seed production areas, and seed orchards and genetic variation patterns in natural populations and plantations. Collect information on ongoing or completed work on relevant subjects. Discuss a project proposal with member countries. It was recommended at the Third Project Advisory Committee Meeting in Colombo, Sri Lanka 13-18 December 1994, that work plans for each species be drawn up. The Species Improvement Network for teak will continue according to the work plan endorsed.